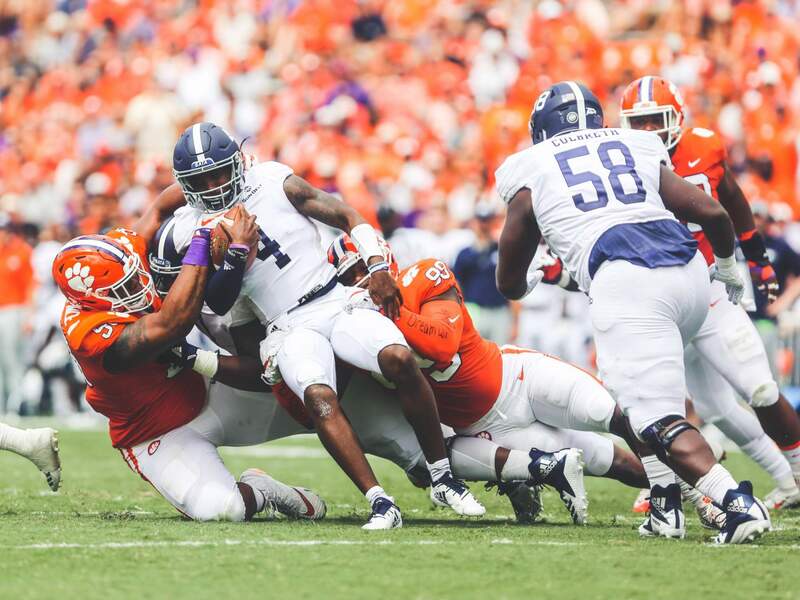 Powered by a 595-yard offensive performance, the No. 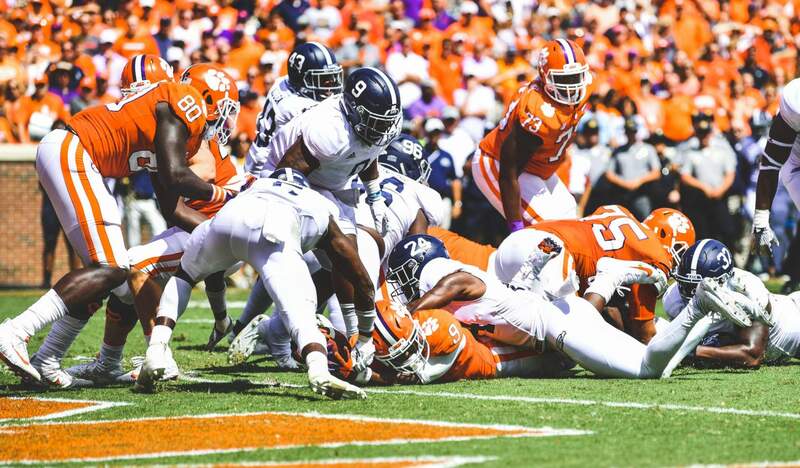 2 Clemson football team defeated the Georgia Southern Eagles by a score of 38-7 on Saturday at Memorial Stadium. 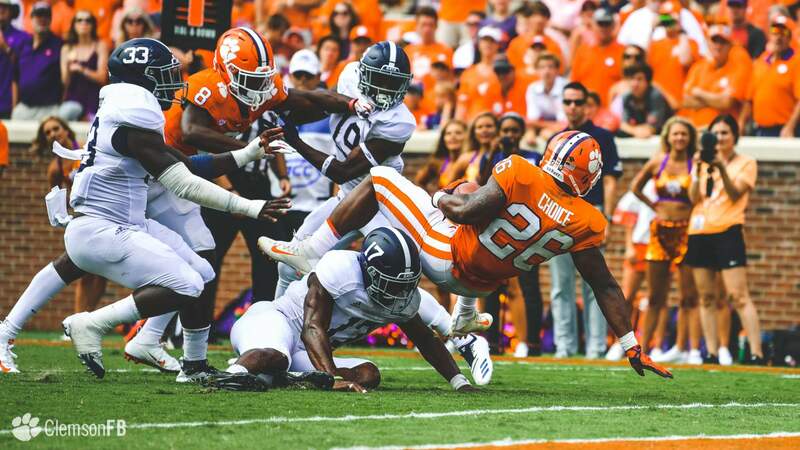 With the win, Clemson remains undefeated on the year at 3-0, while Georgia Southern fell to 2-1. 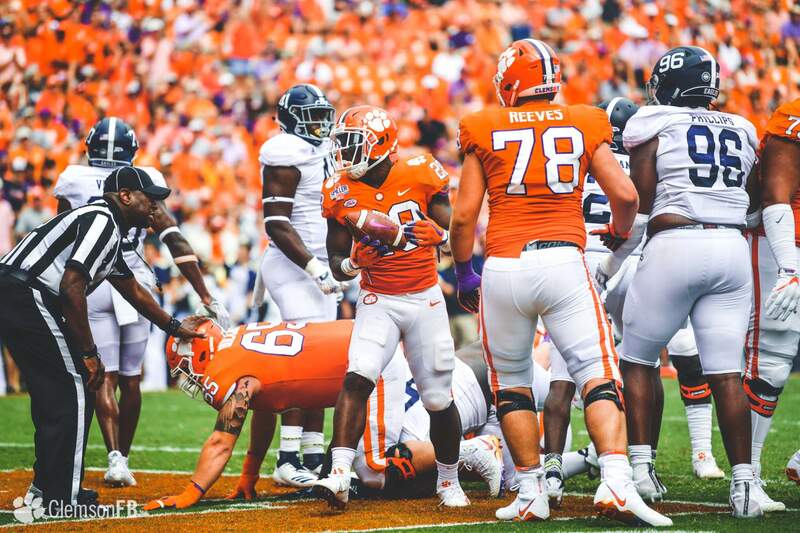 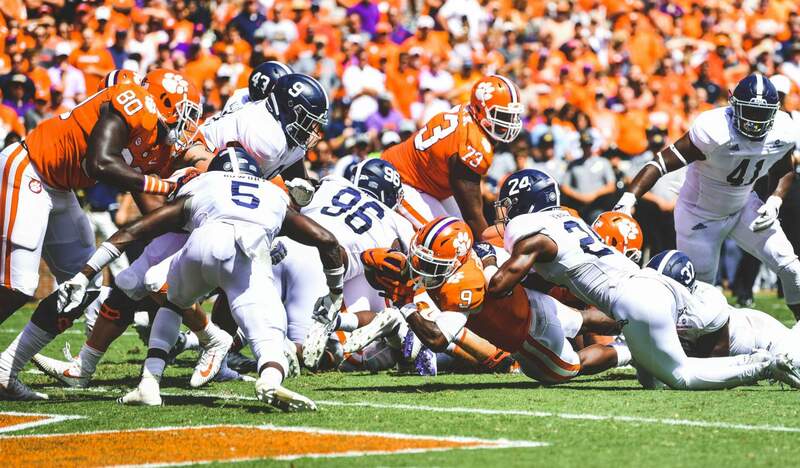 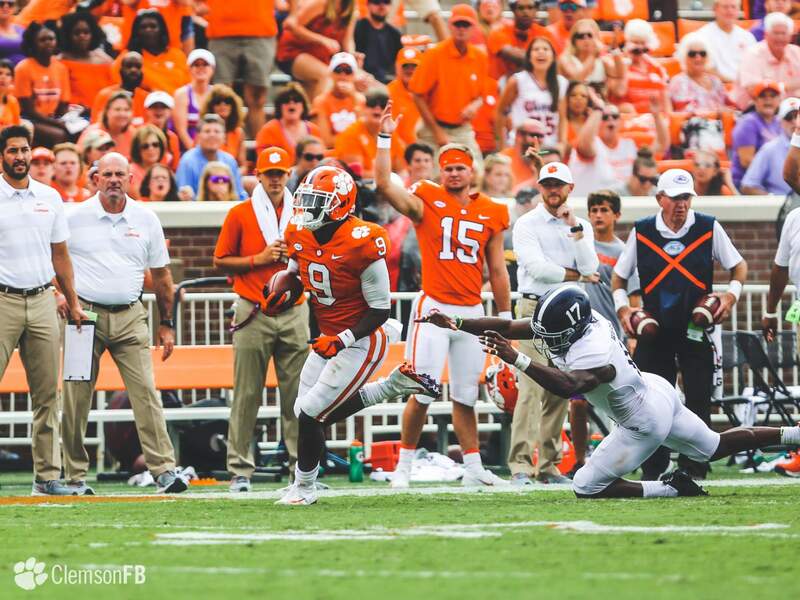 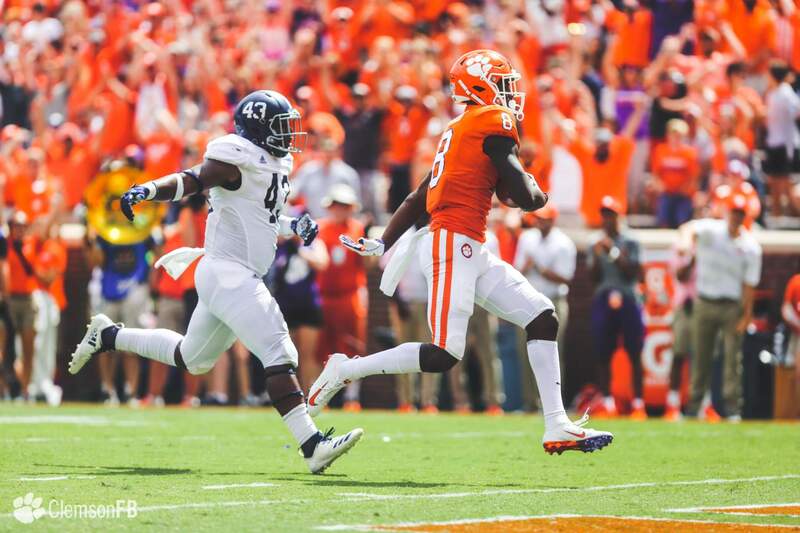 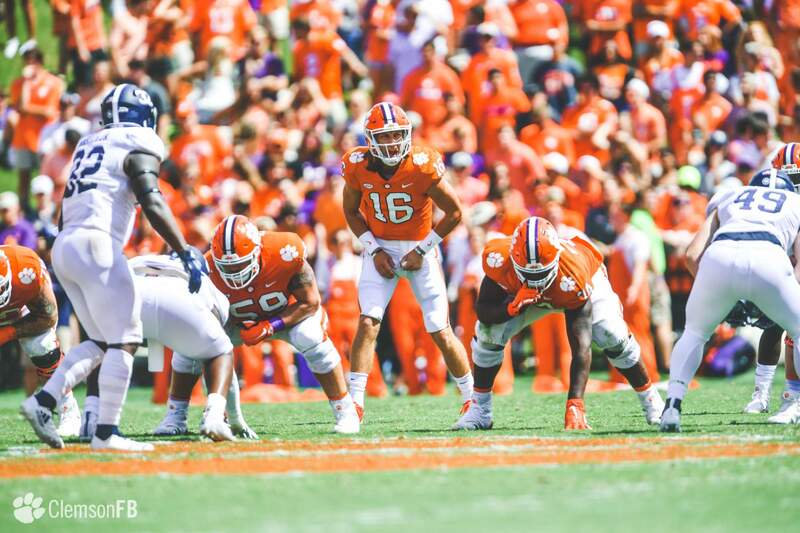 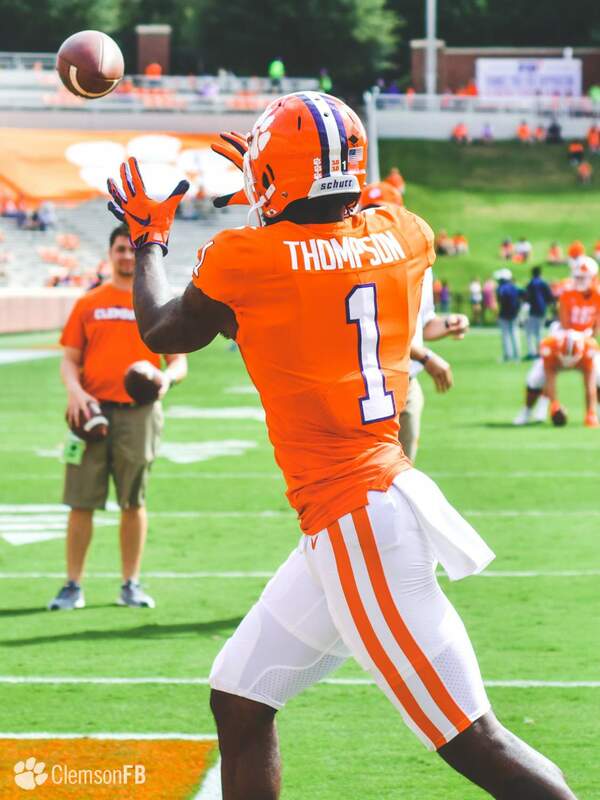 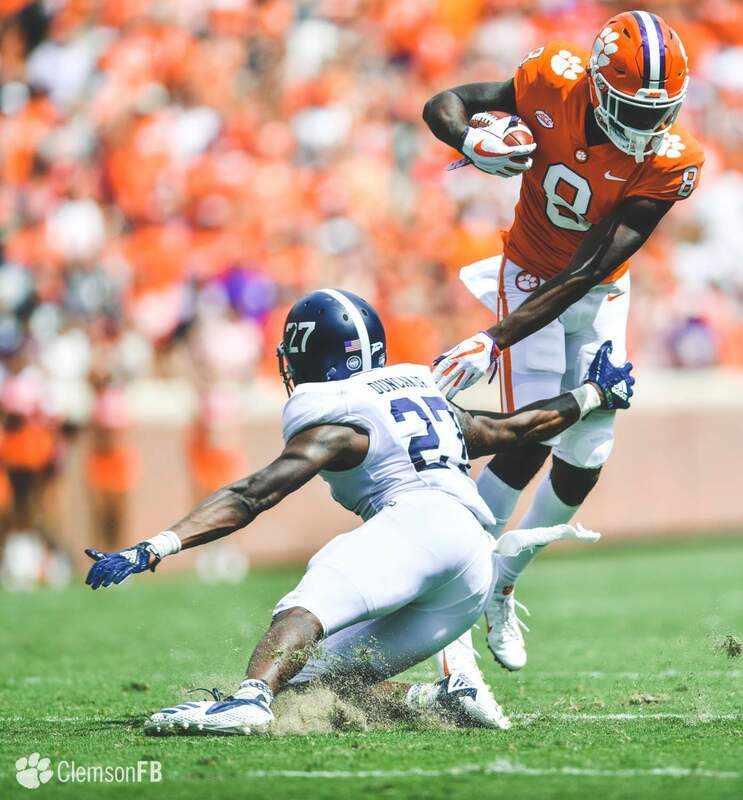 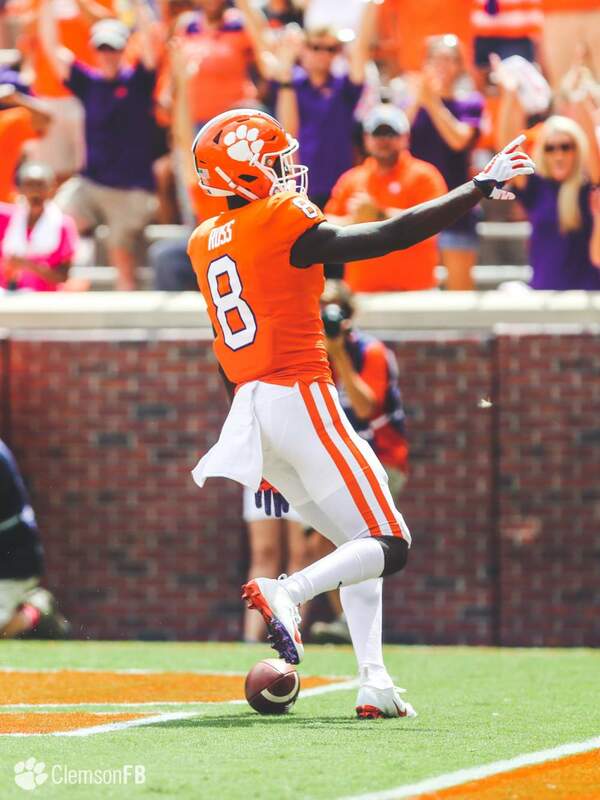 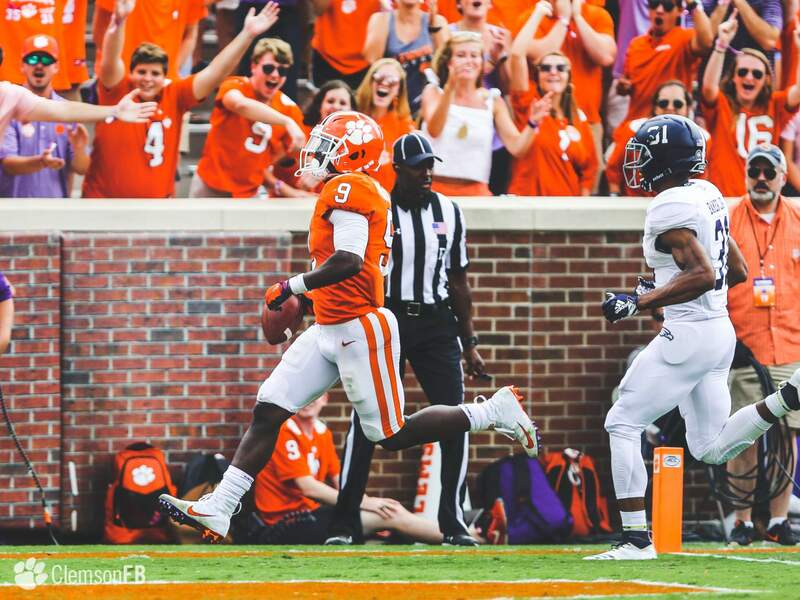 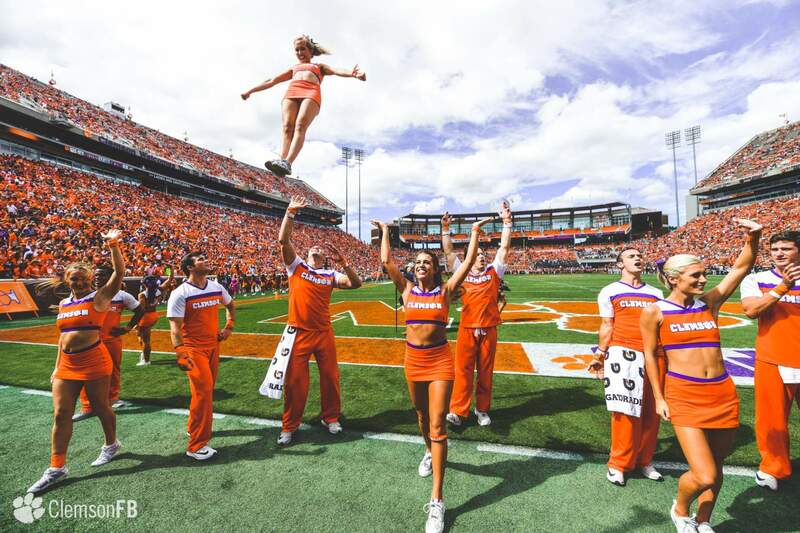 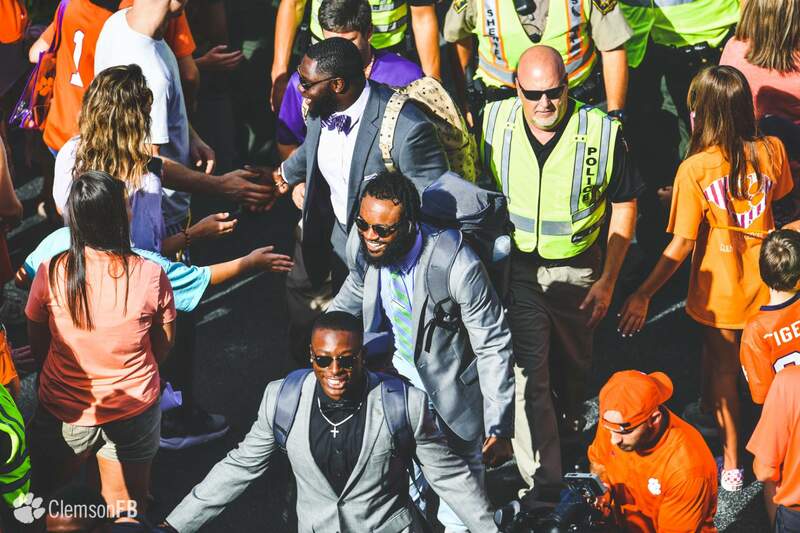 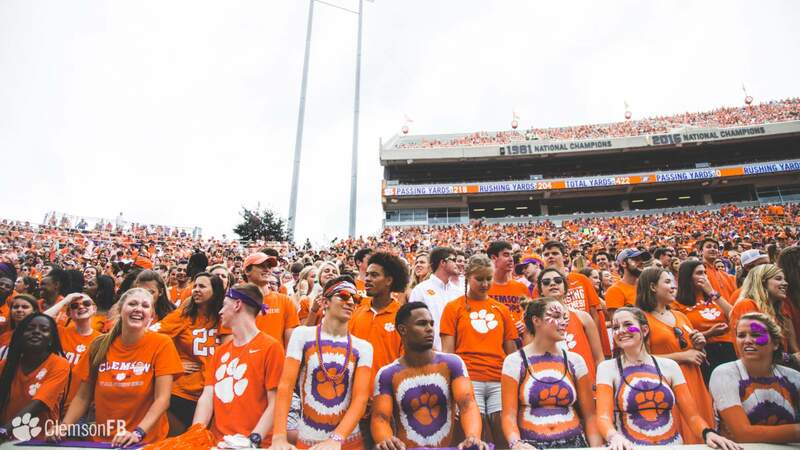 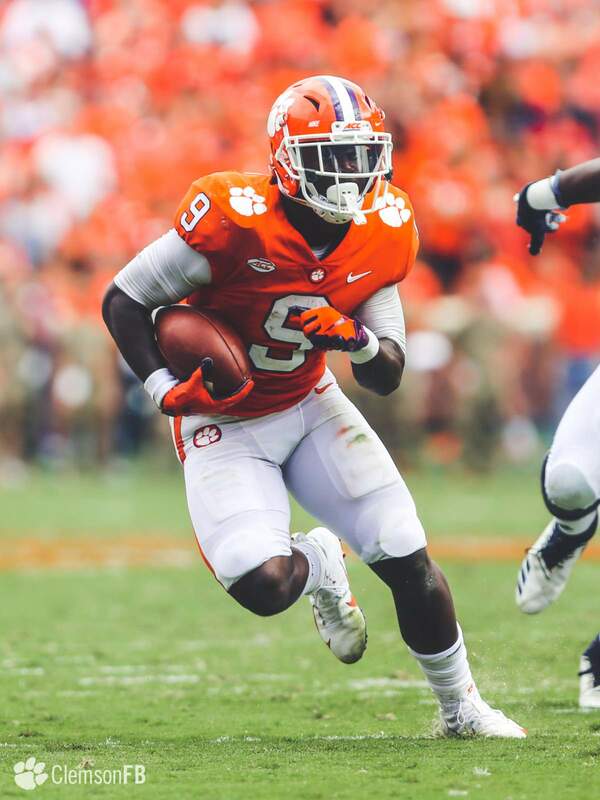 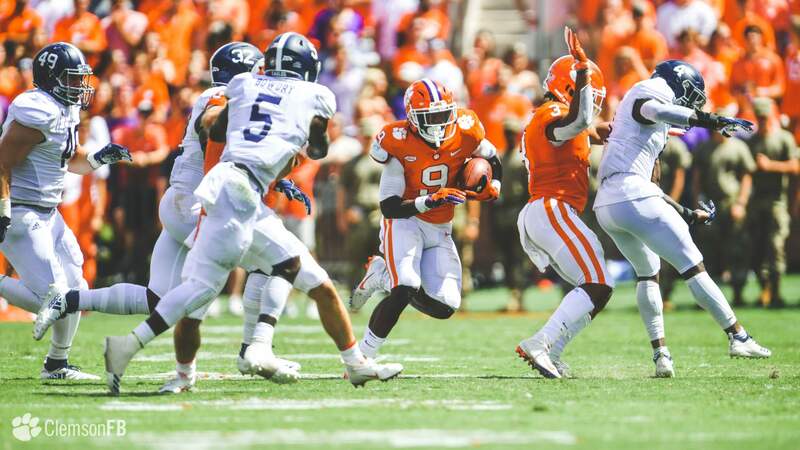 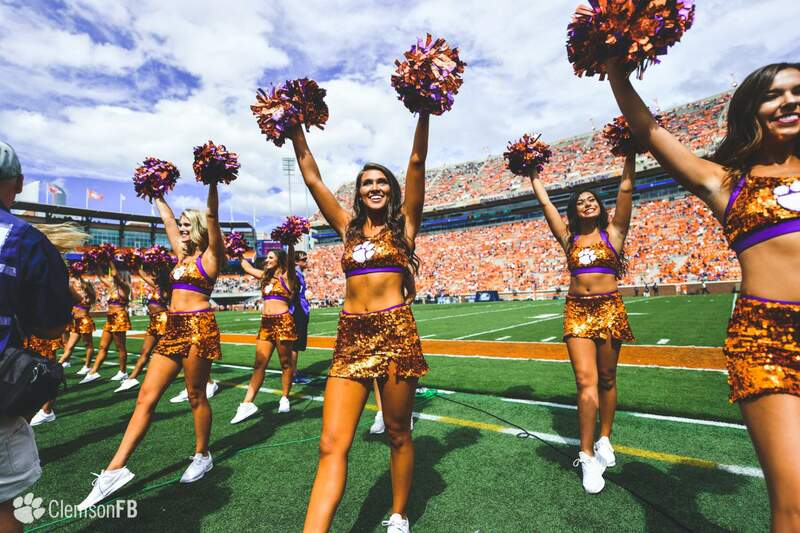 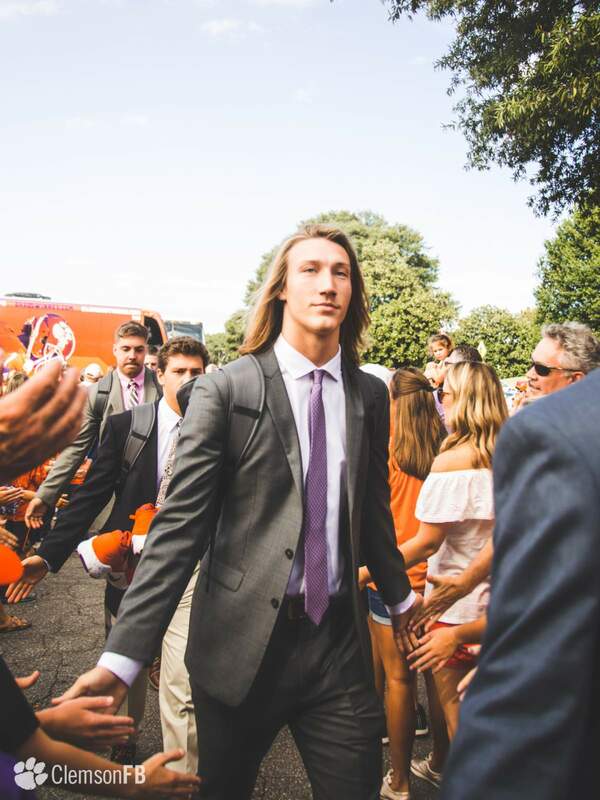 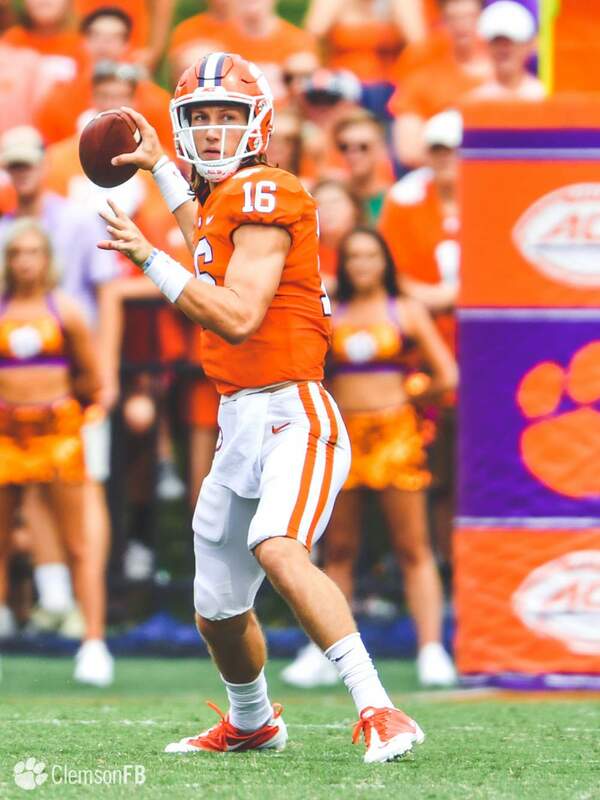 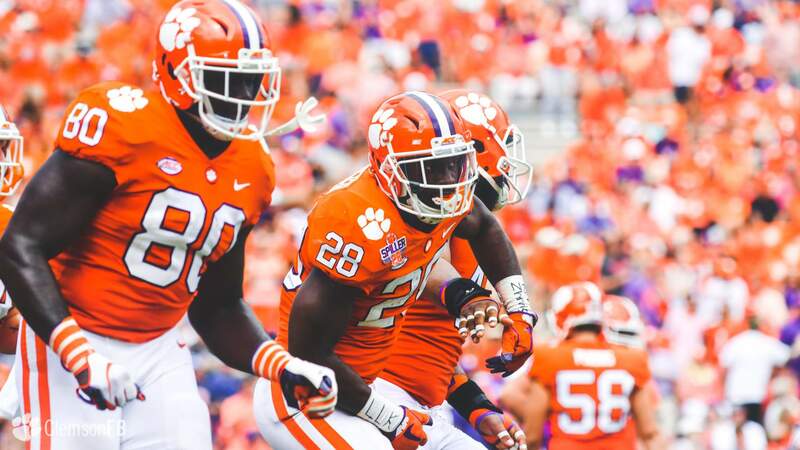 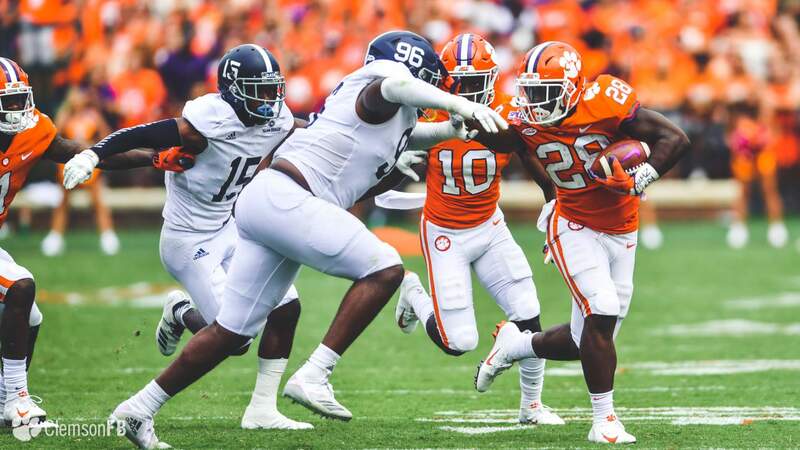 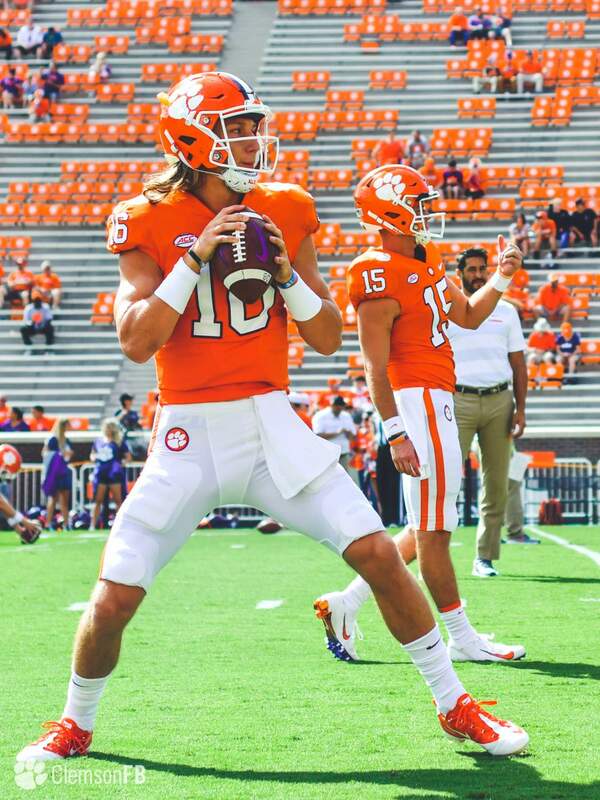 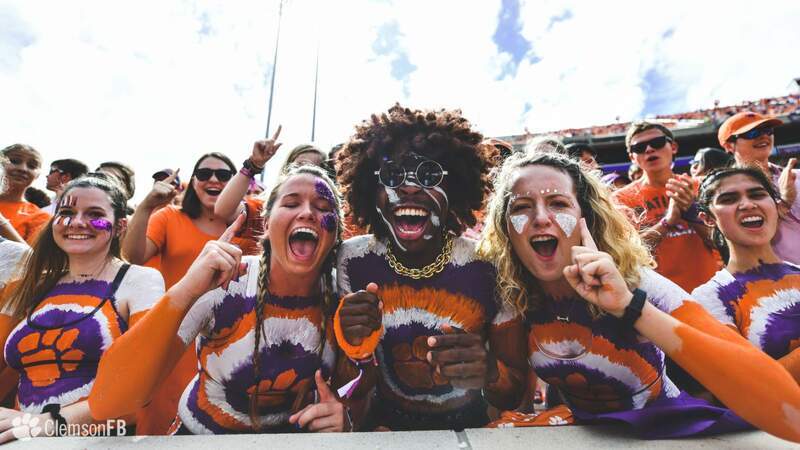 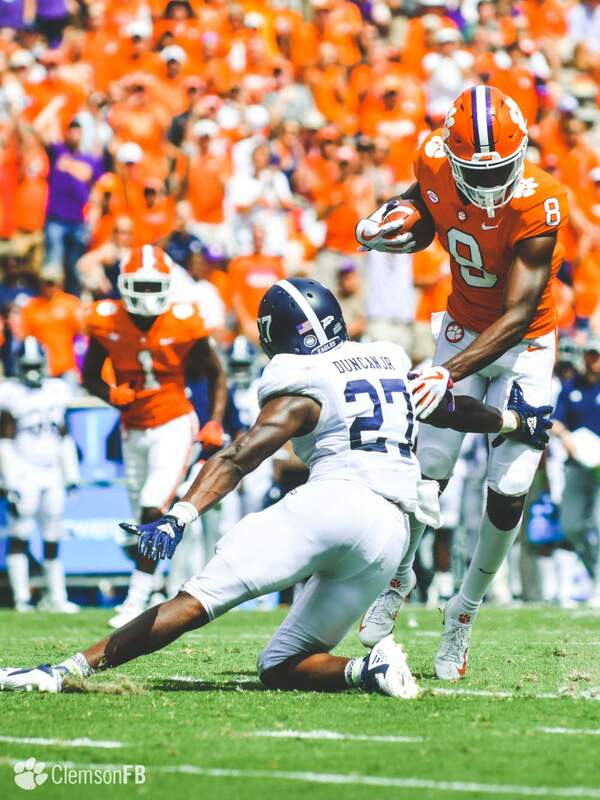 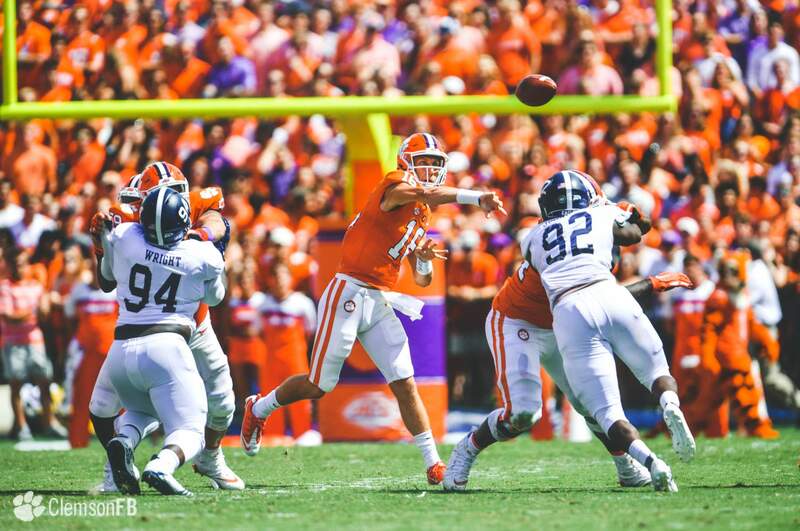 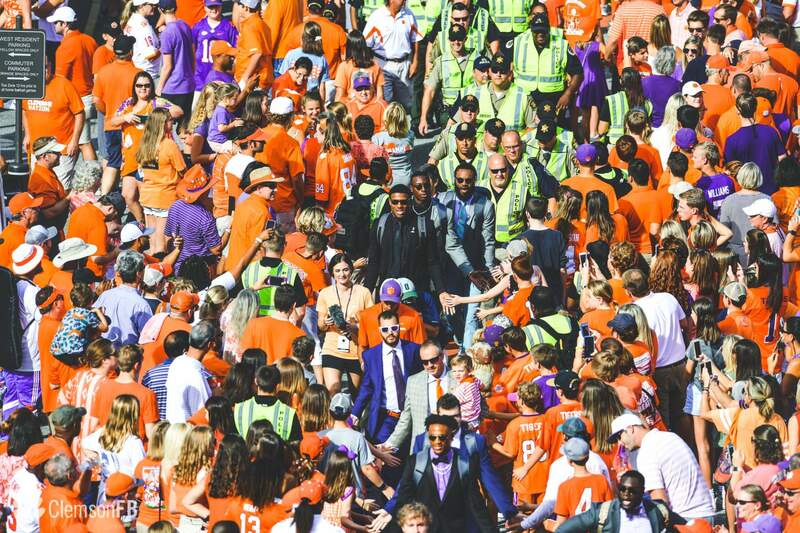 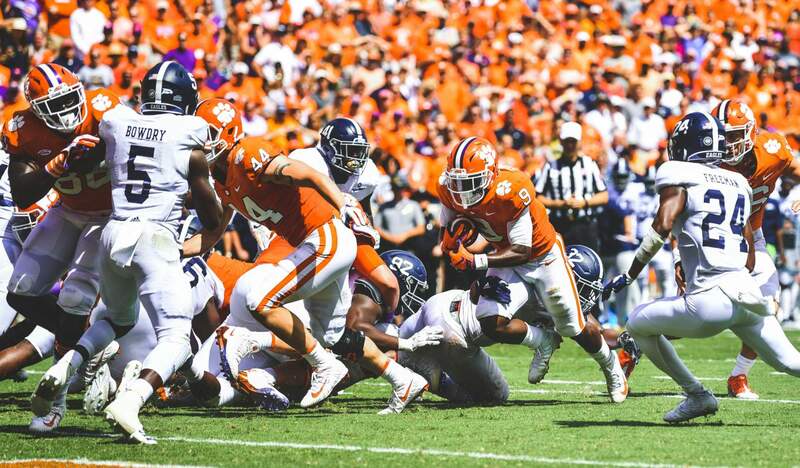 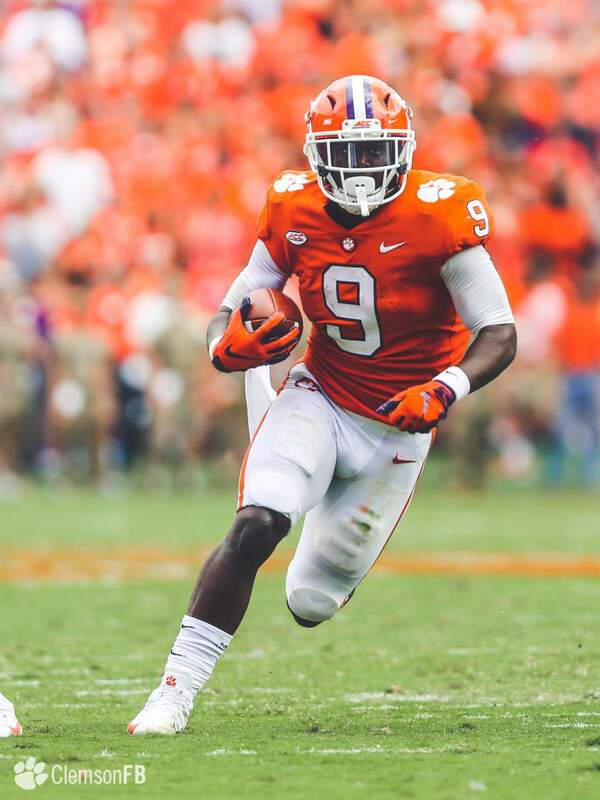 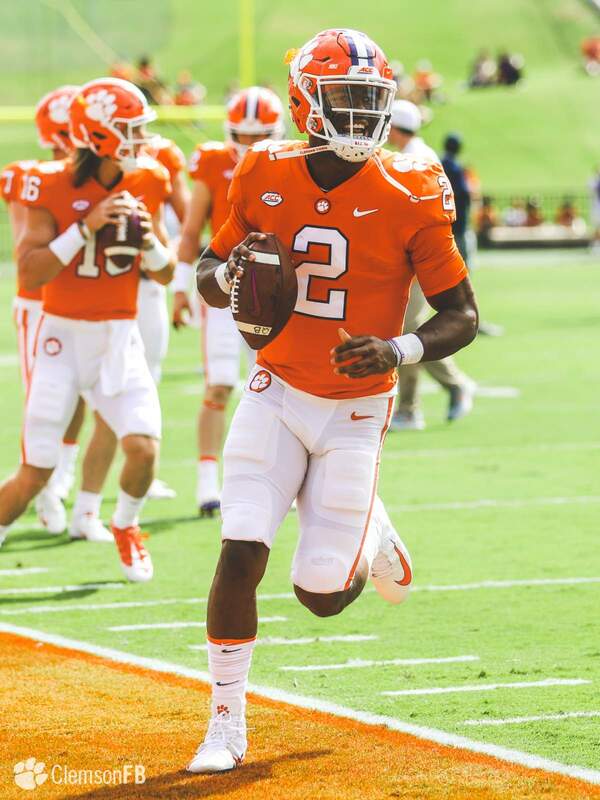 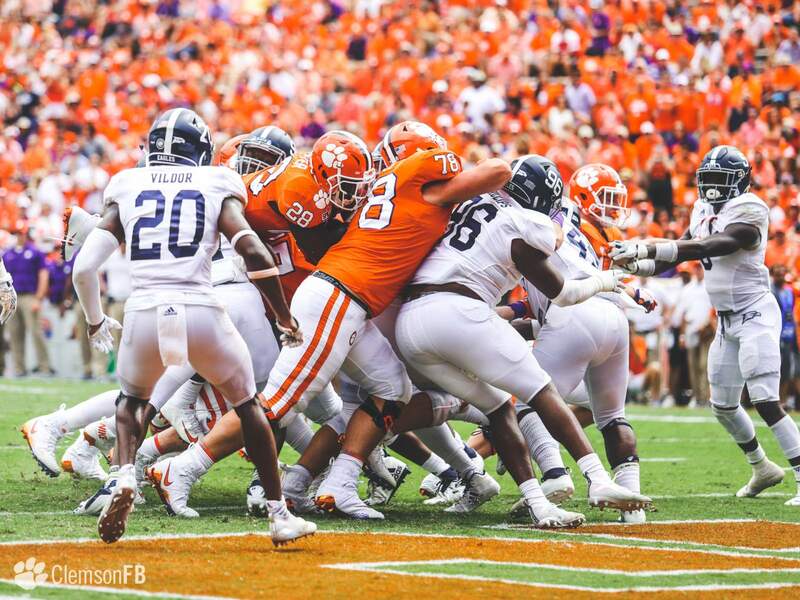 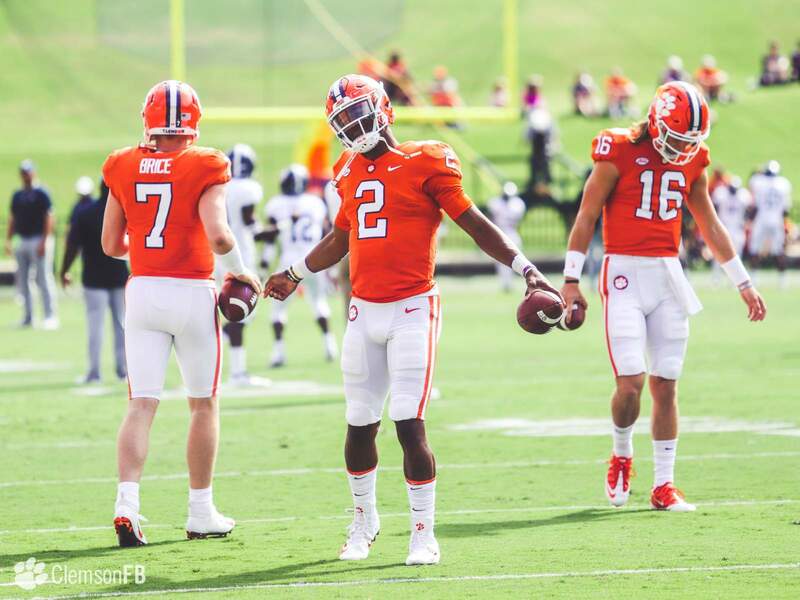 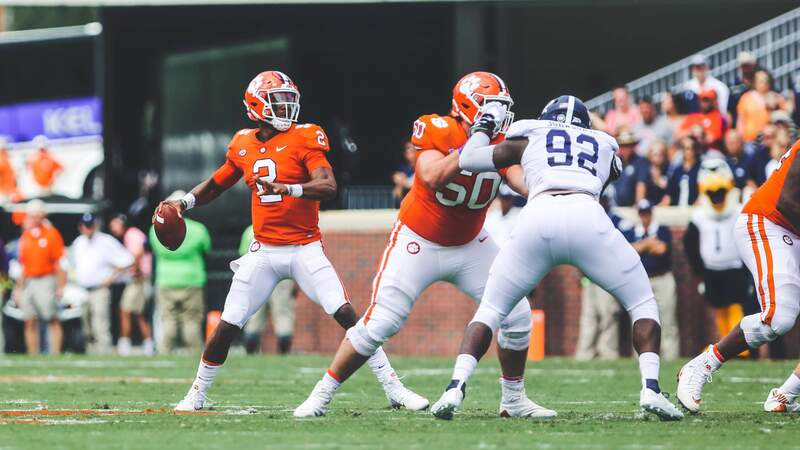 Offensively, Clemson was sparked by Travis Etienne, who ran for 162 yards on 16 carries with two touchdowns, and Trevor Lawrence, who was 12-19 for 194 yards and a score. 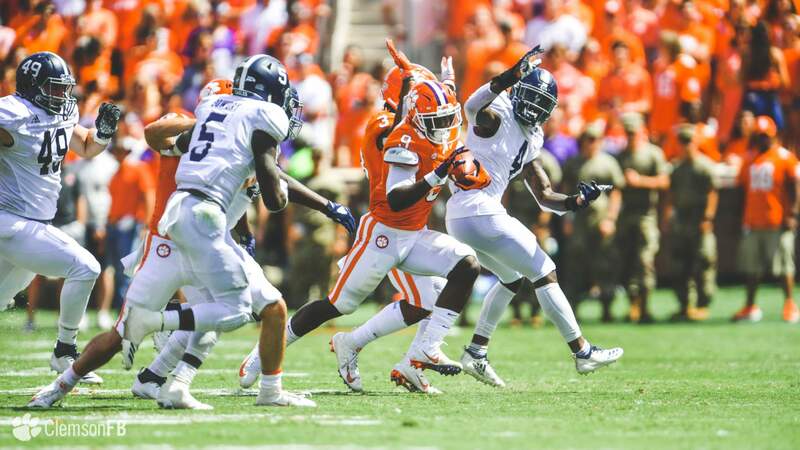 Justyn Ross also topped the 100-yard mark, totaling 103 yards and adding a touchdown on three catches. 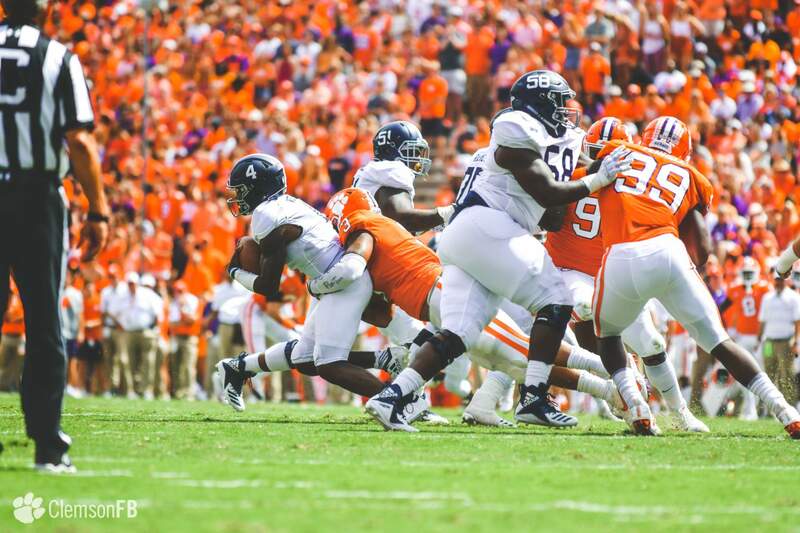 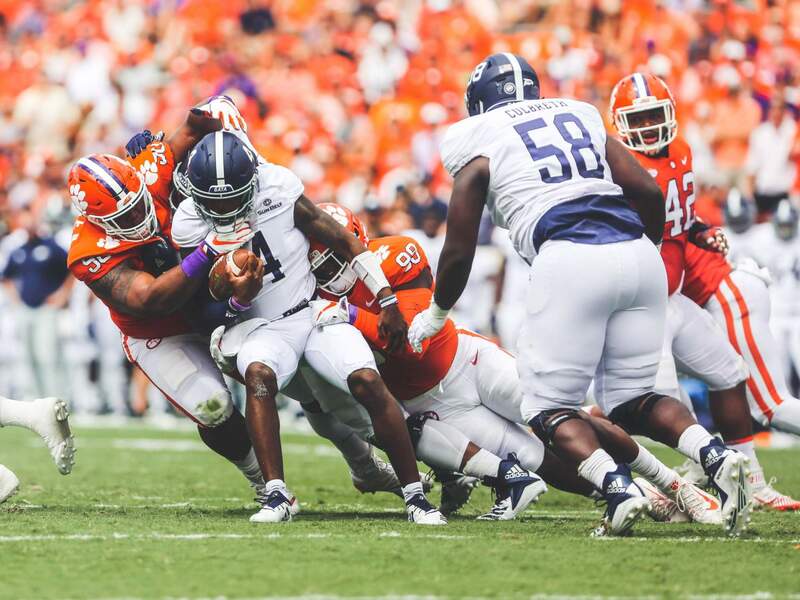 Defensively, the Tigers held Georgia Southern scoreless through three quarters, limiting the Eagle offense to just 30 yards in the entire first half. 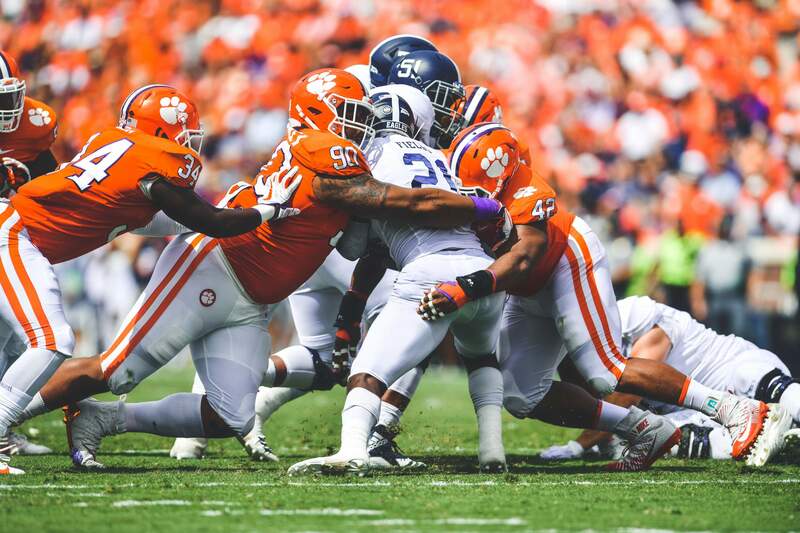 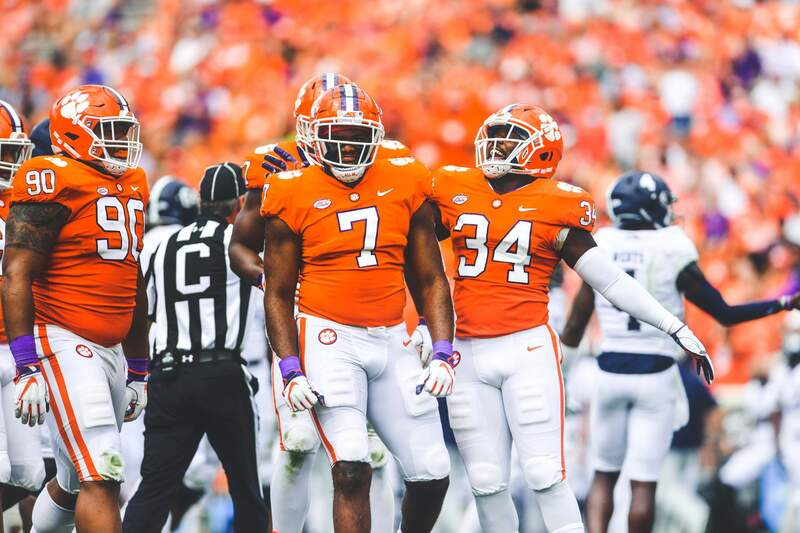 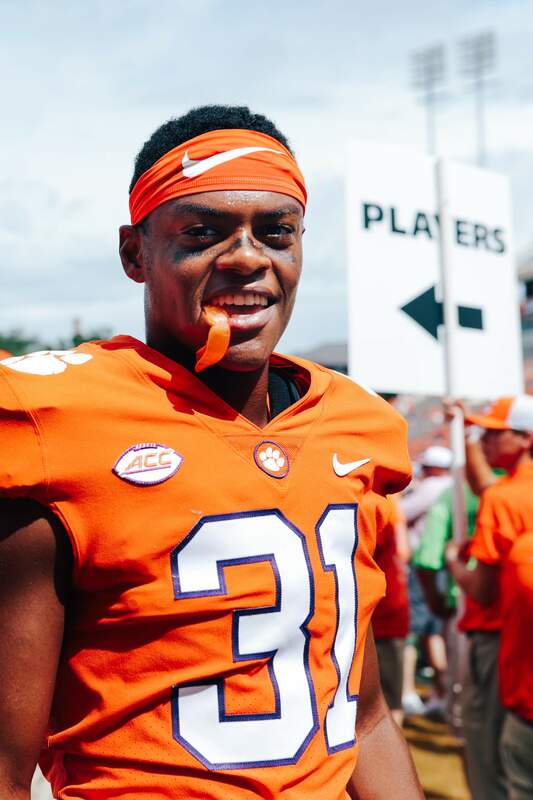 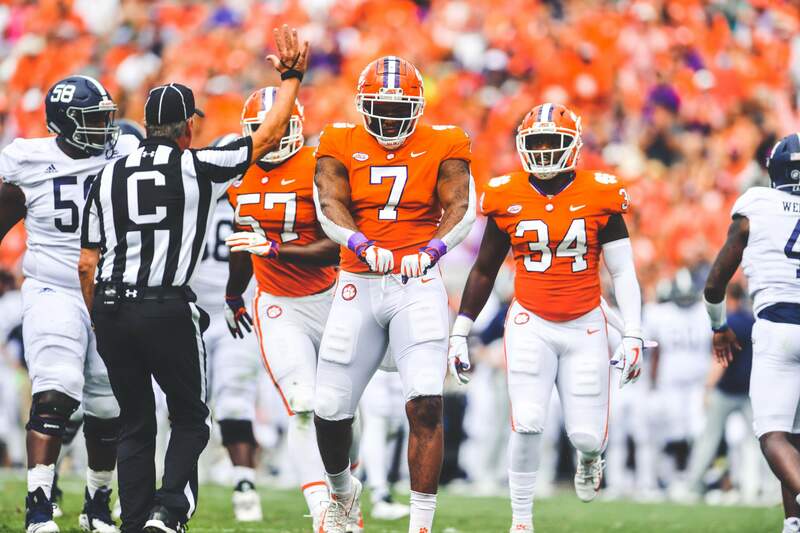 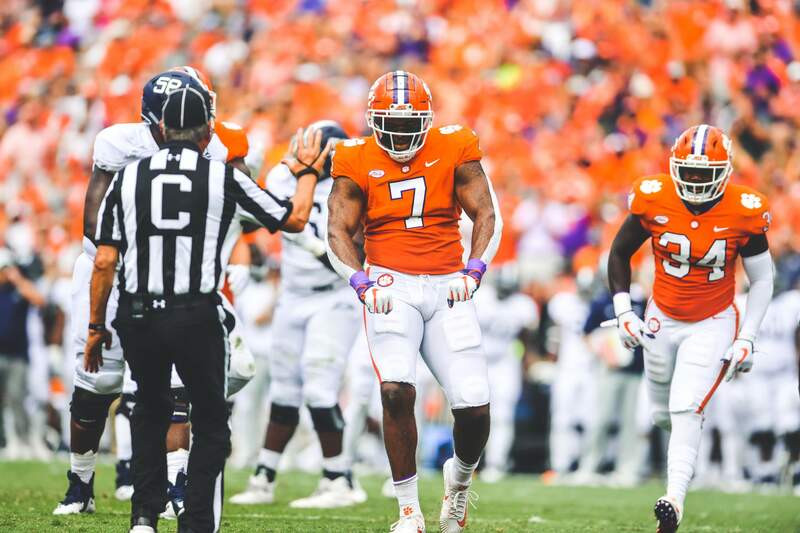 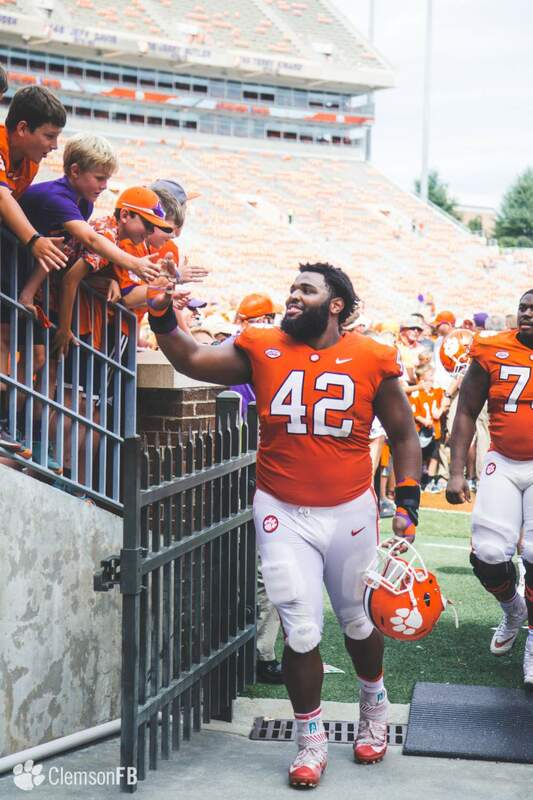 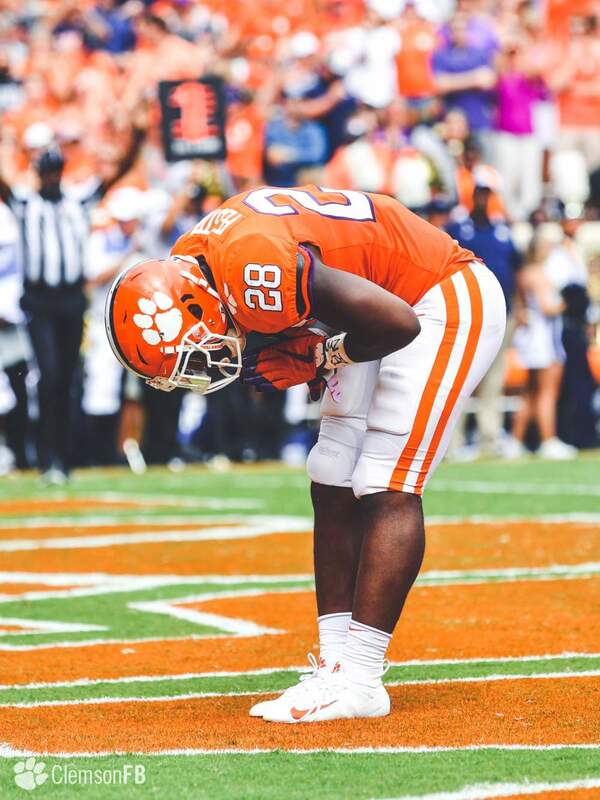 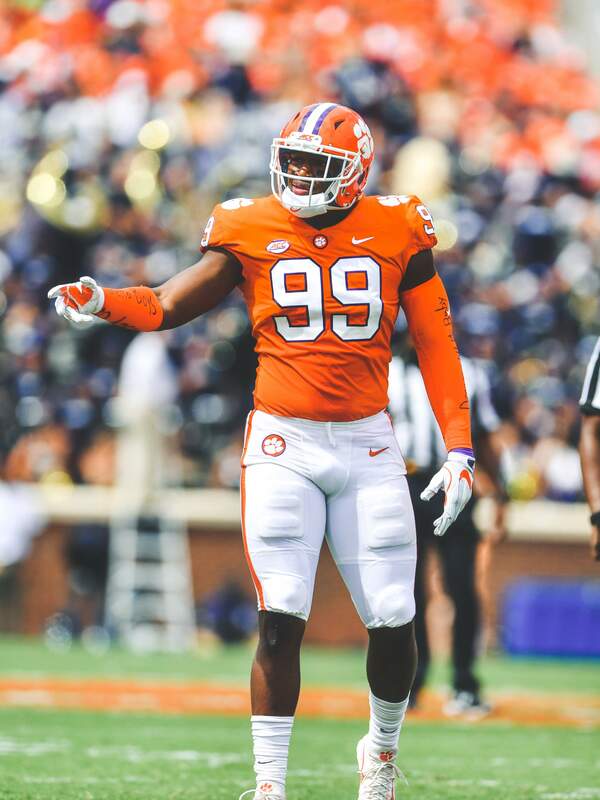 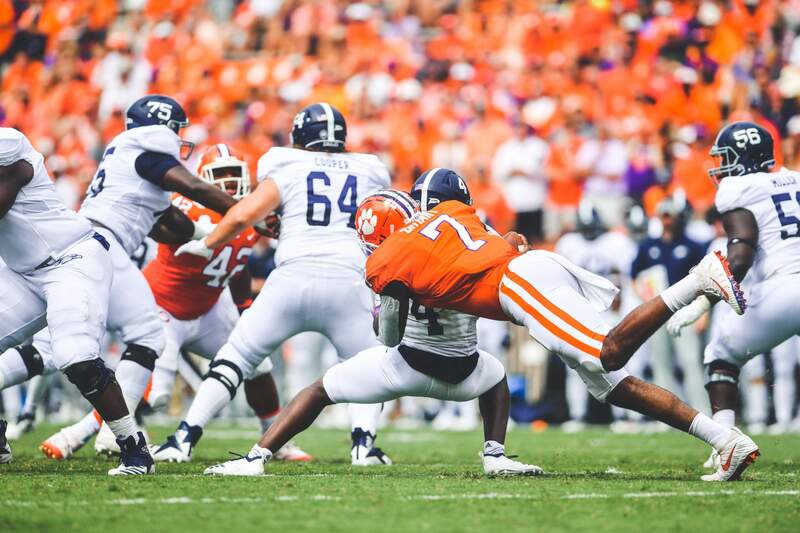 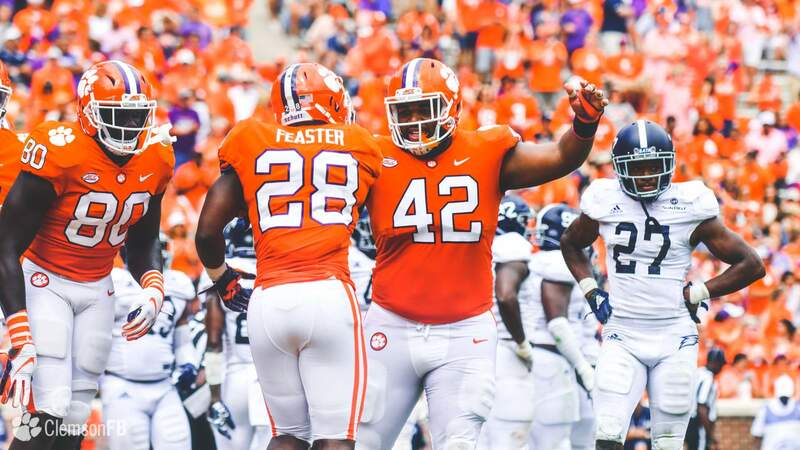 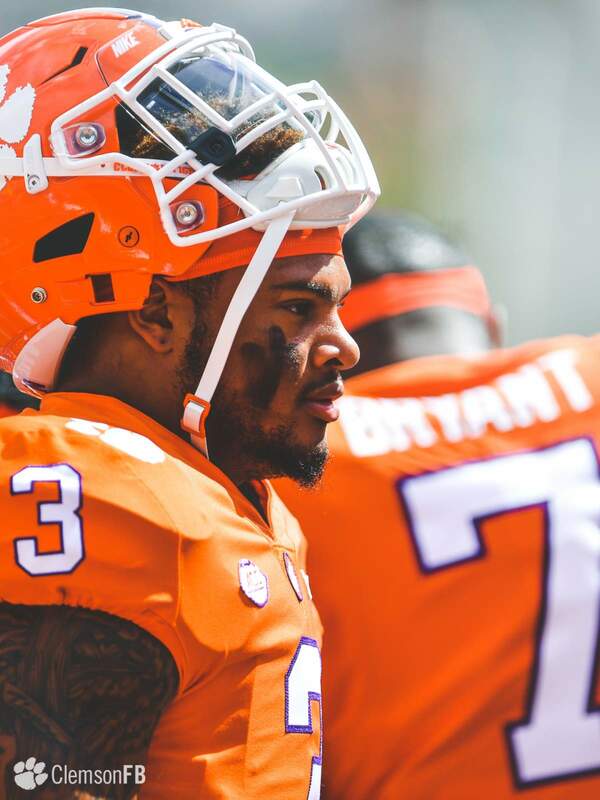 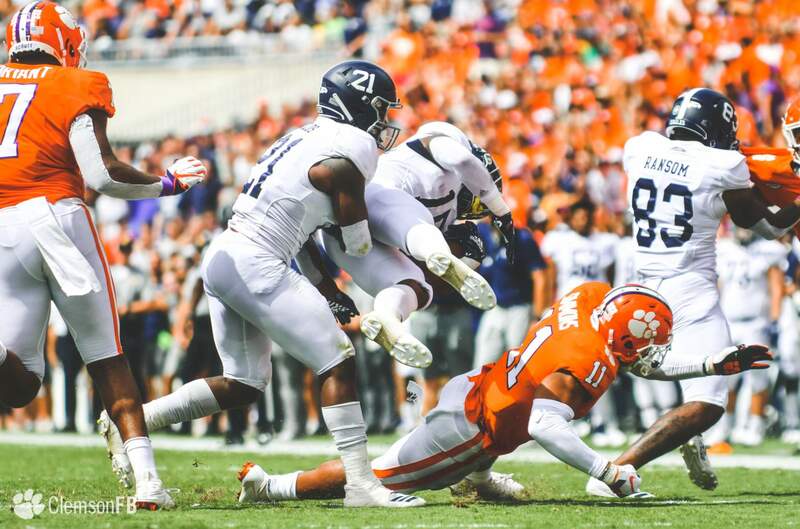 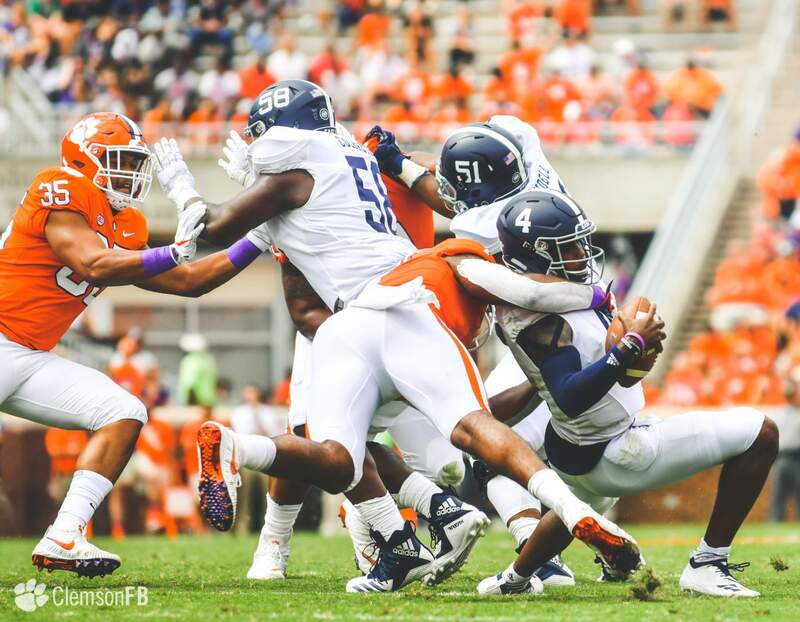 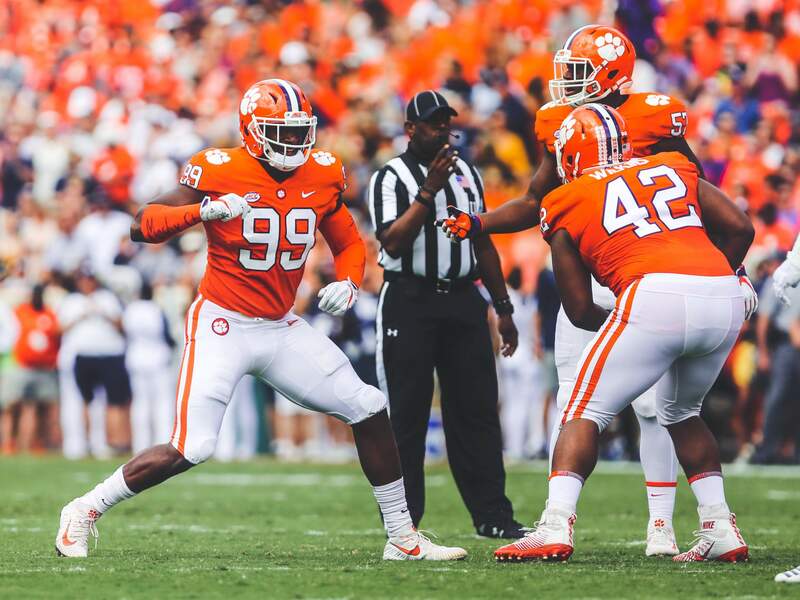 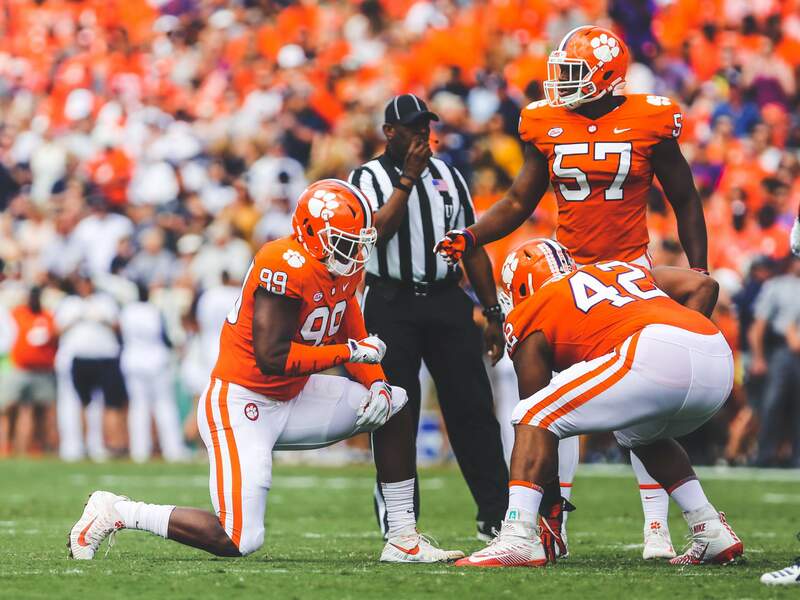 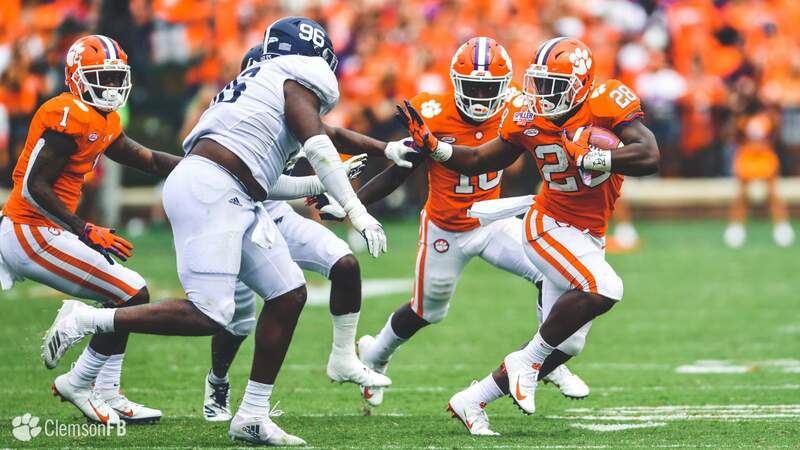 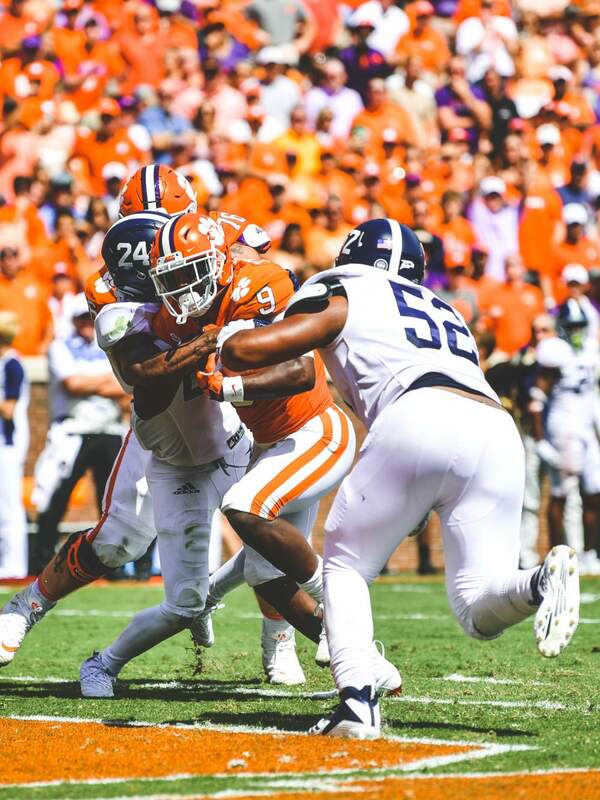 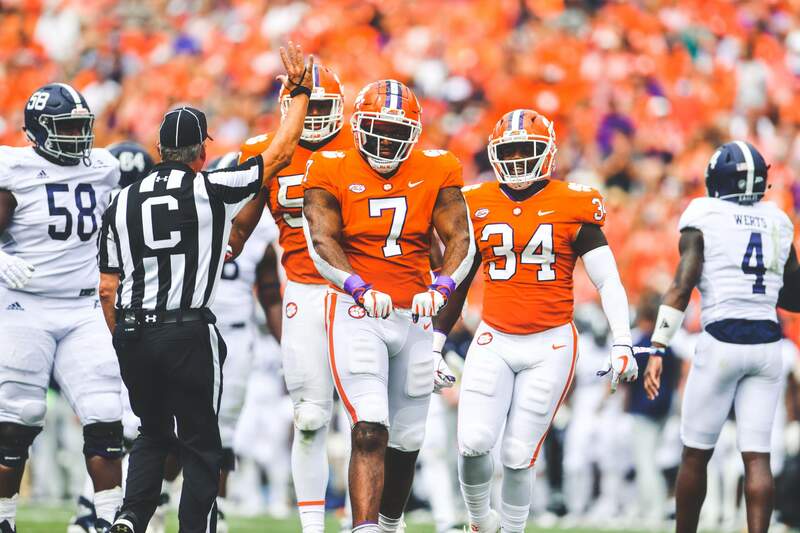 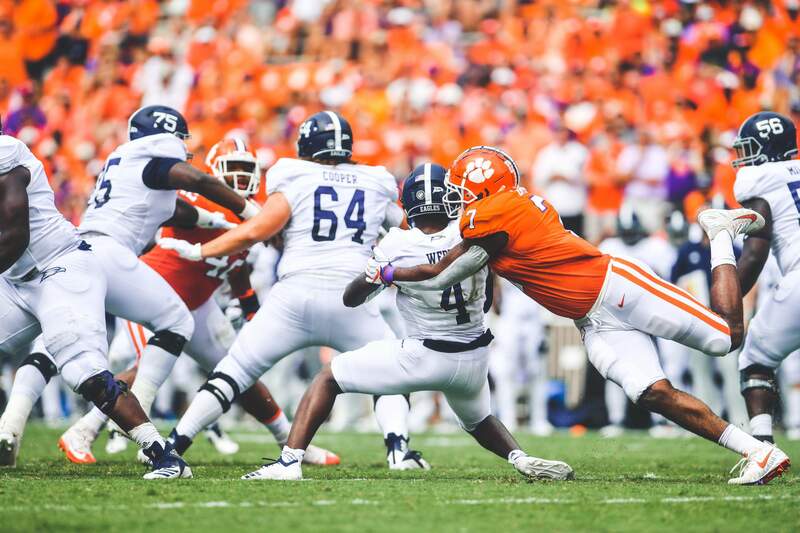 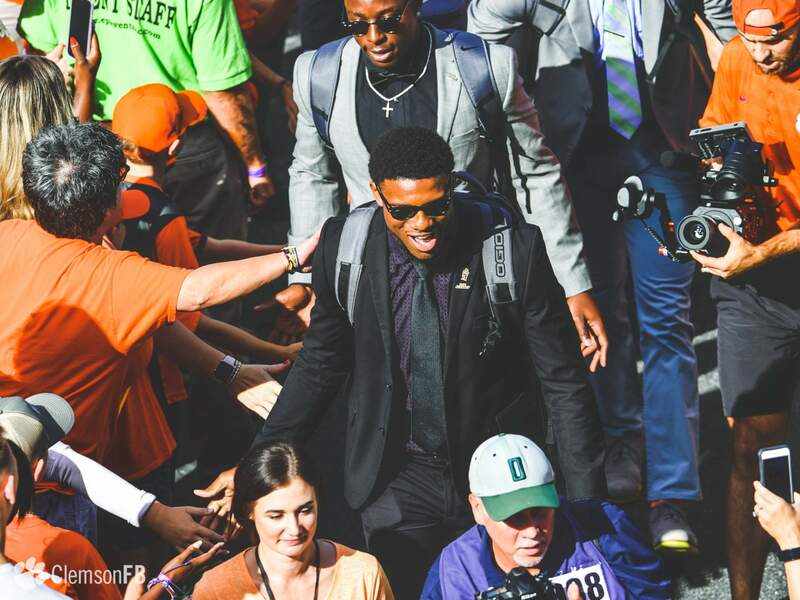 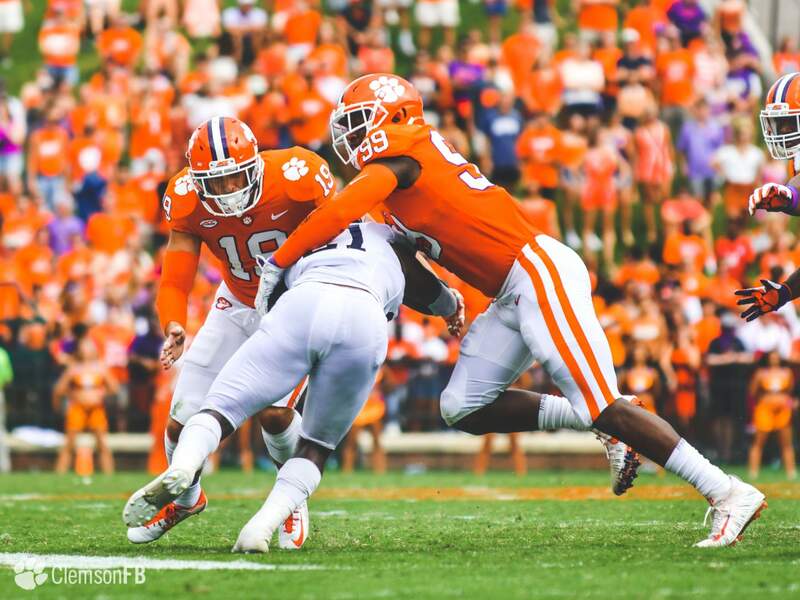 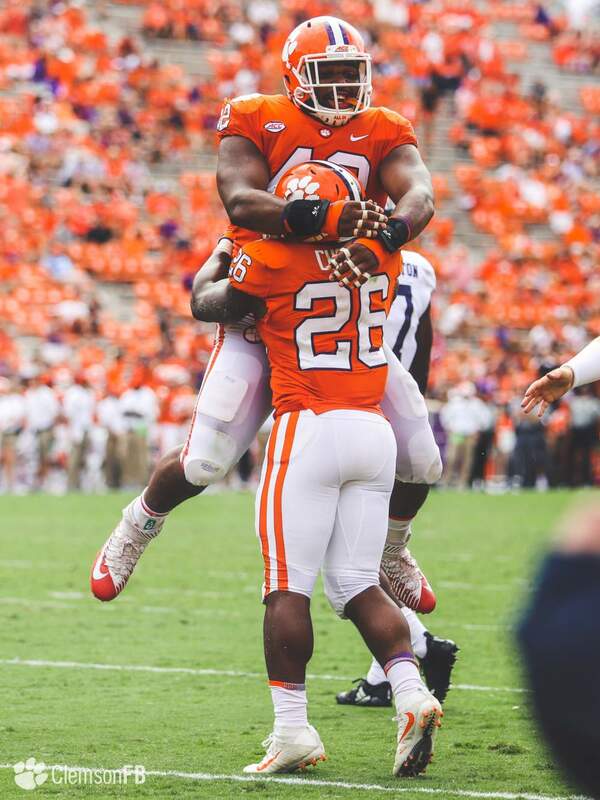 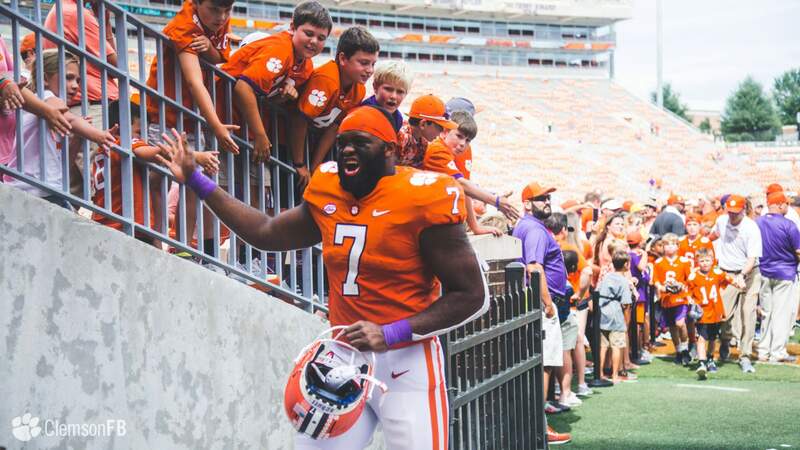 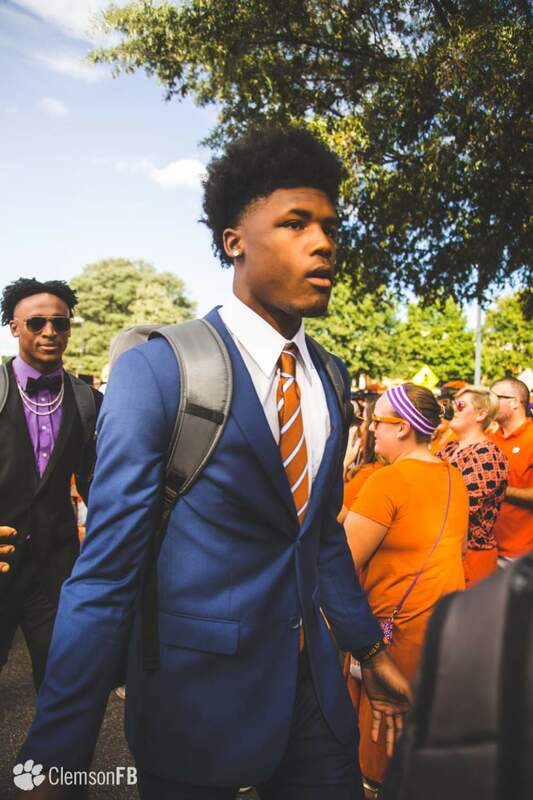 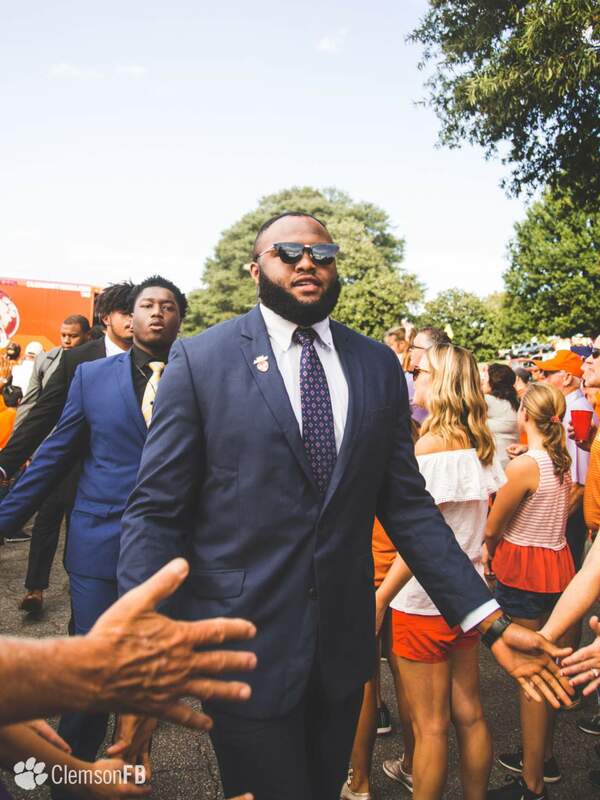 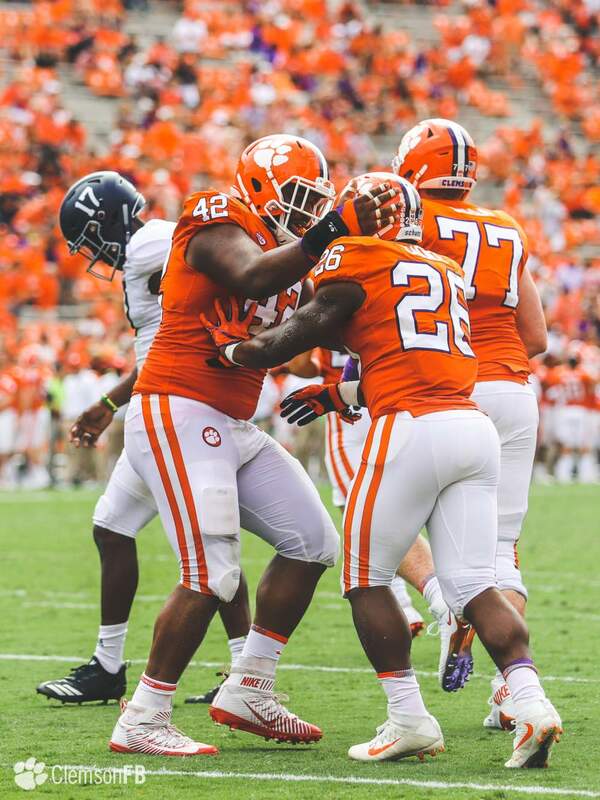 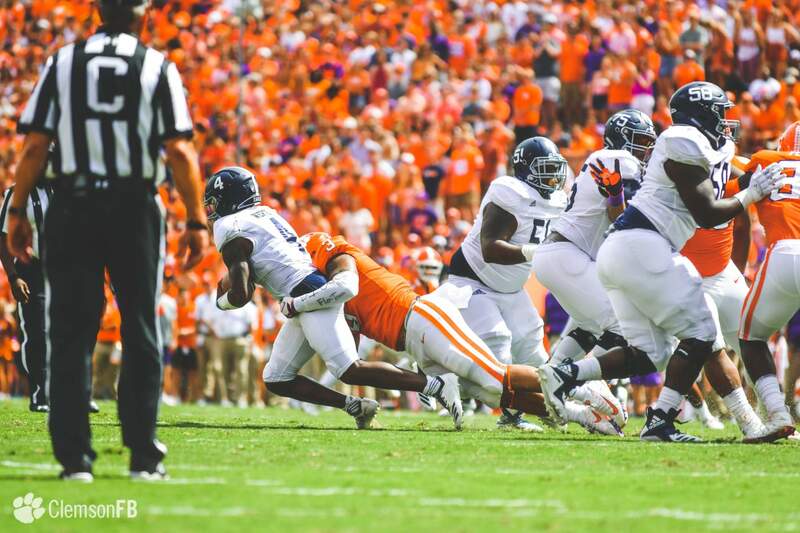 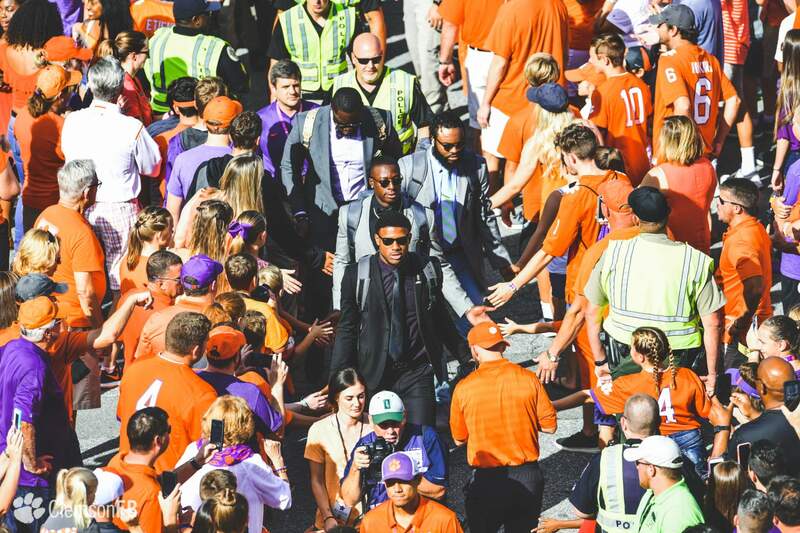 Tre Lamar led the team with 11 total tackles, Clelin Ferrell contributed a team-high 2.5 tackles for loss and two sacks, and Austin Bryant matched Ferrell’s two sacks. 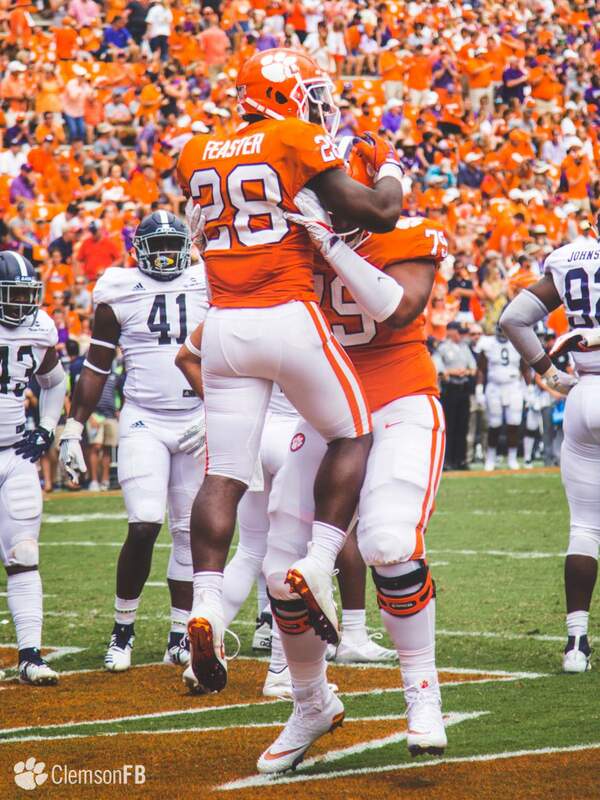 True Freshman to True Freshman! 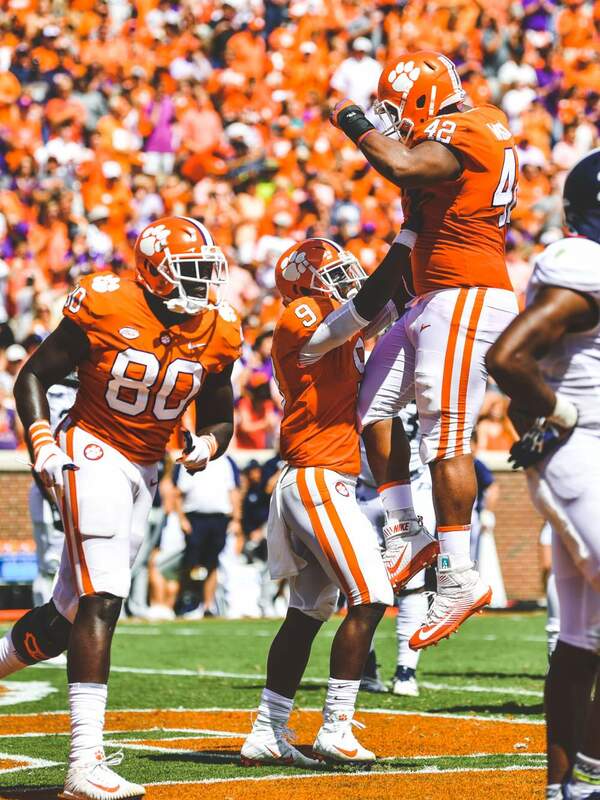 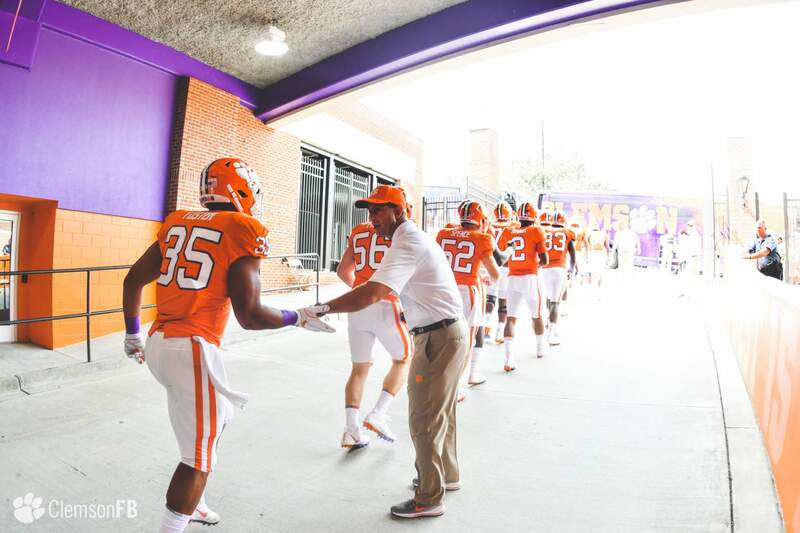 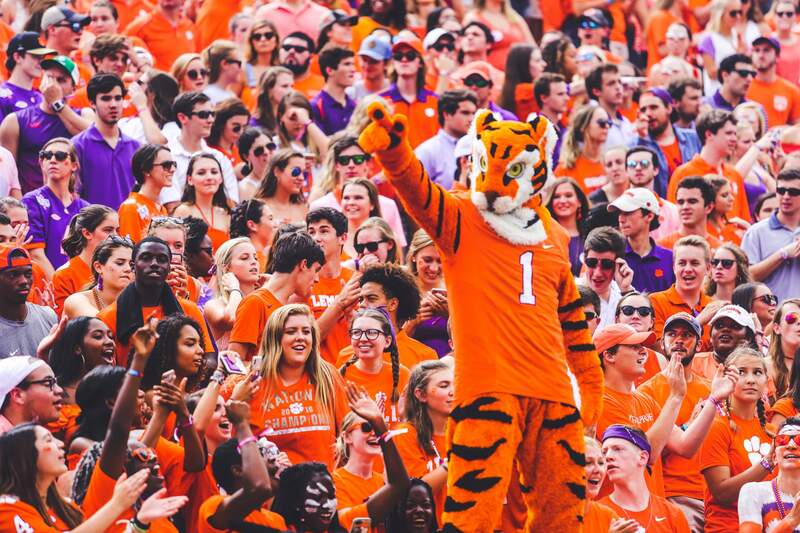 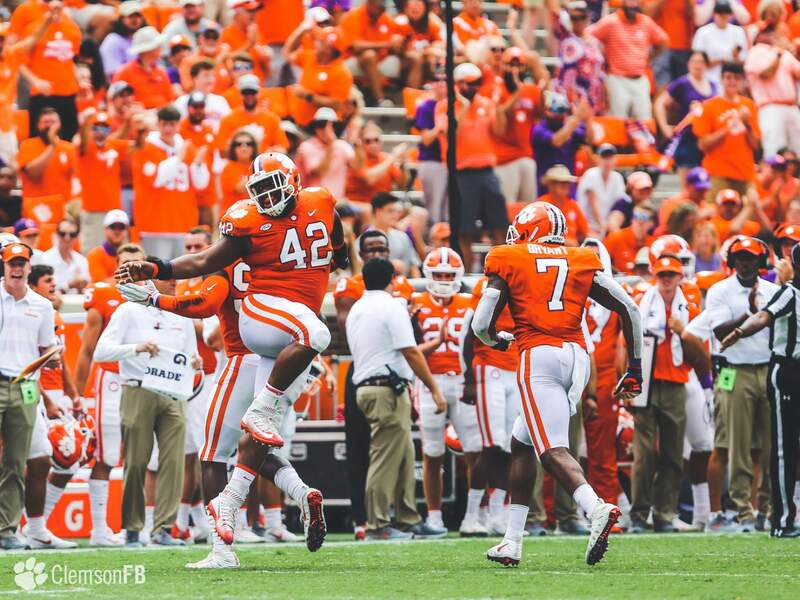 Clemson has now won 46 of its last 50 games, dating to 2014. 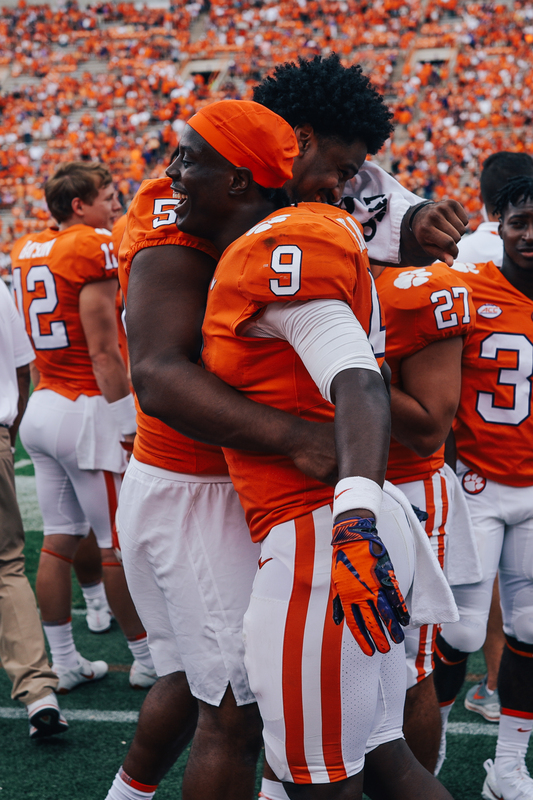 Clemson has now opened 3-0 for four straight years and for the seventh time in the last eight years. 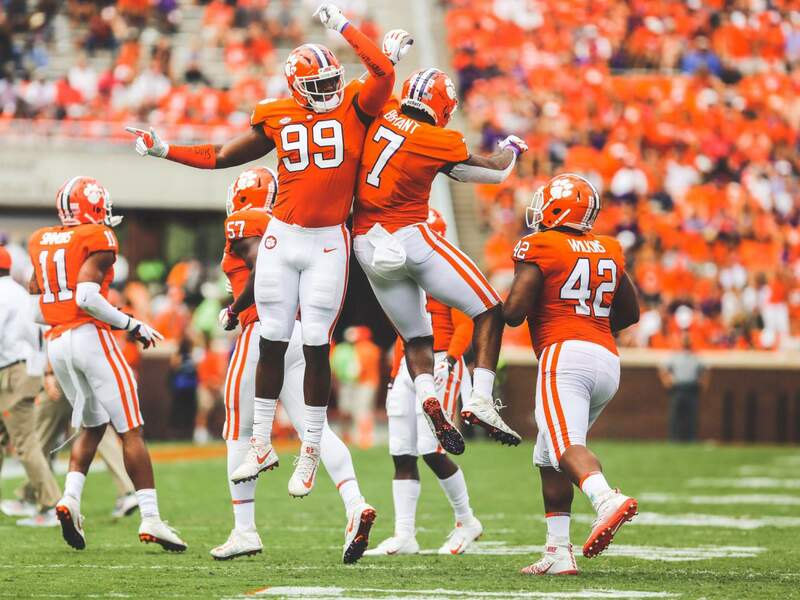 Clemson extended its winning streak in non-conference regular season play to 18 games. 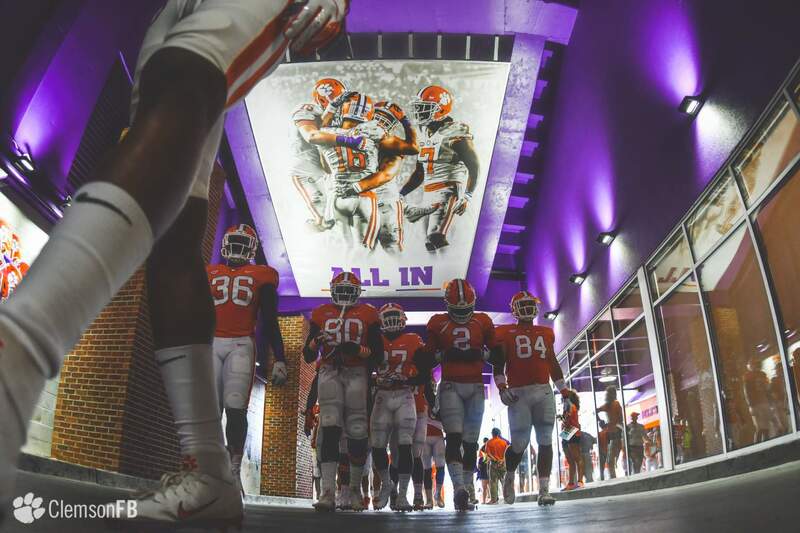 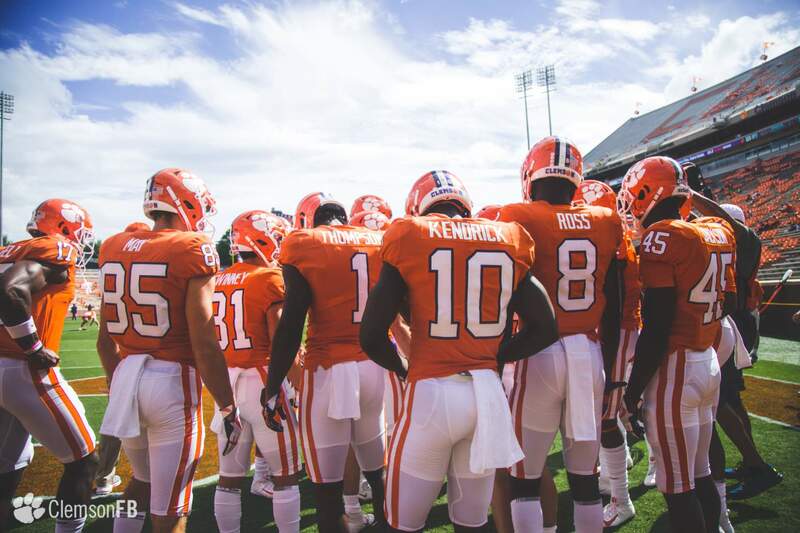 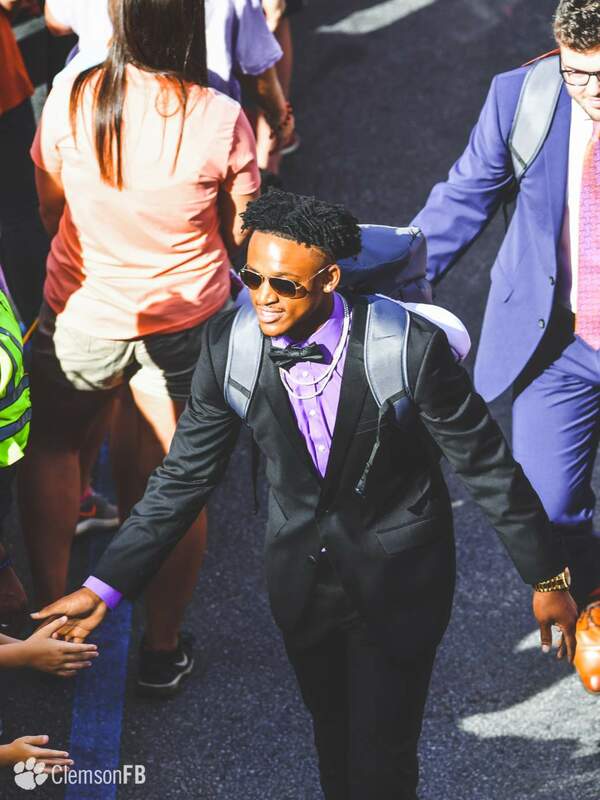 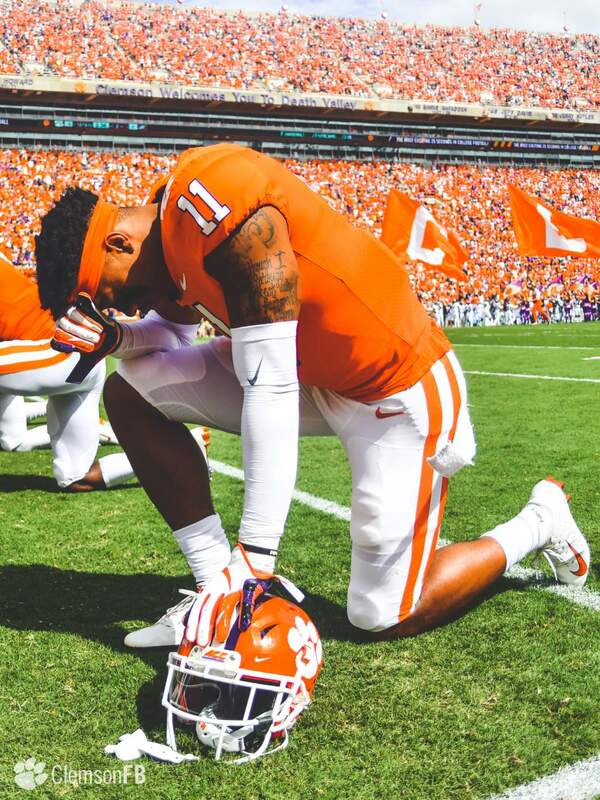 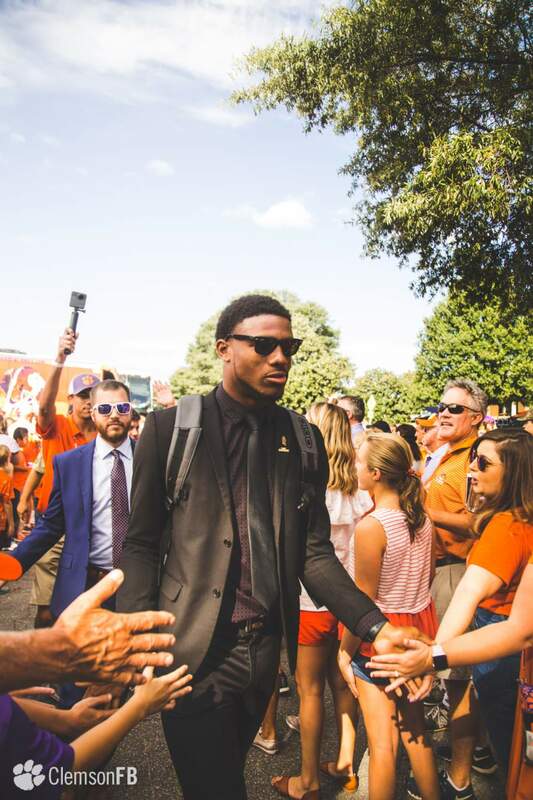 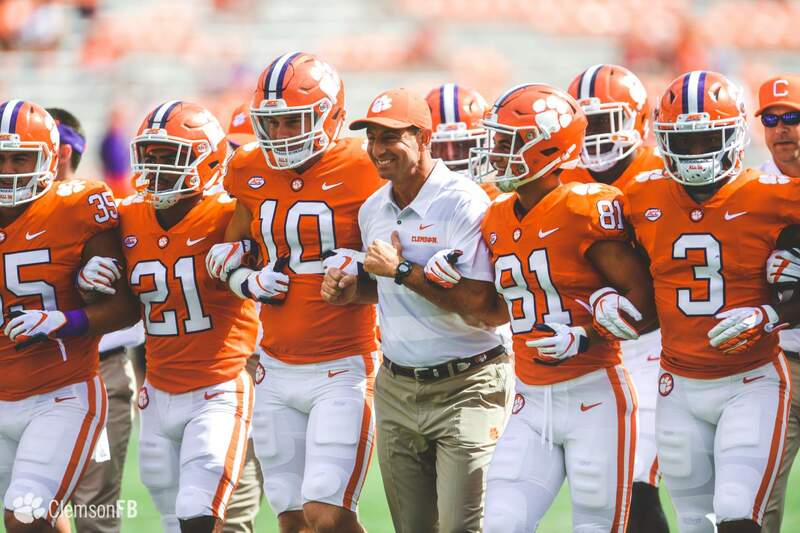 Dating back to 2014, Clemson’s current 17-game winning streak in regular season non-conference games entering the game was already the longest such streak in program history. 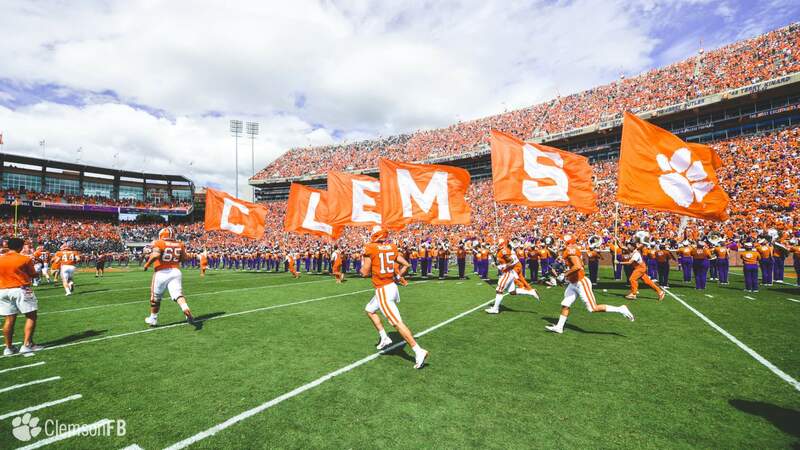 Clemson won its 10th consecutive game at Memorial Stadium, dating back to a 56-7 win against South Carolina on Nov. 25, 2016. 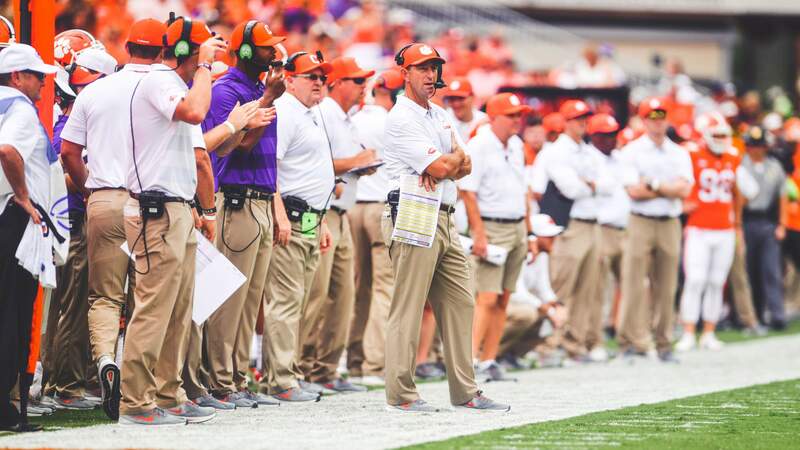 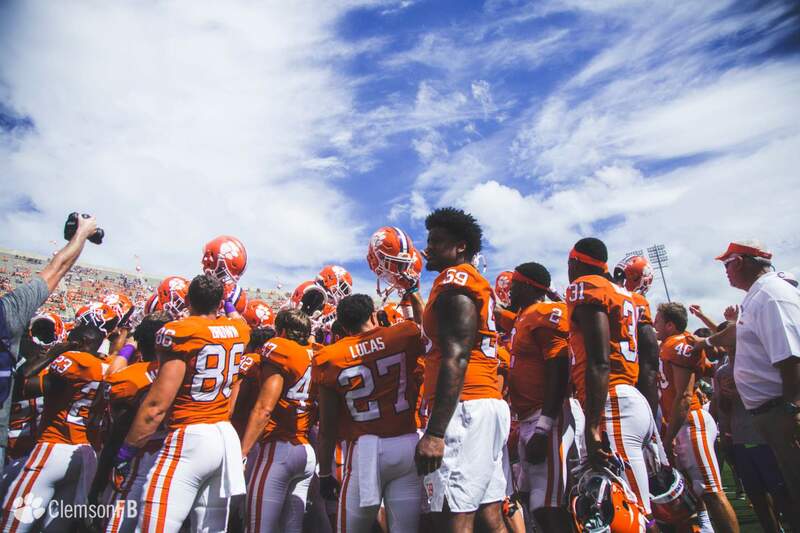 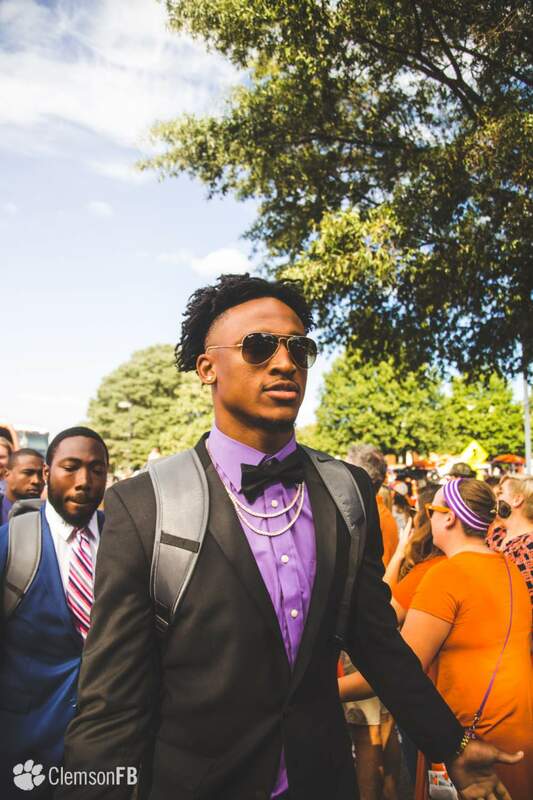 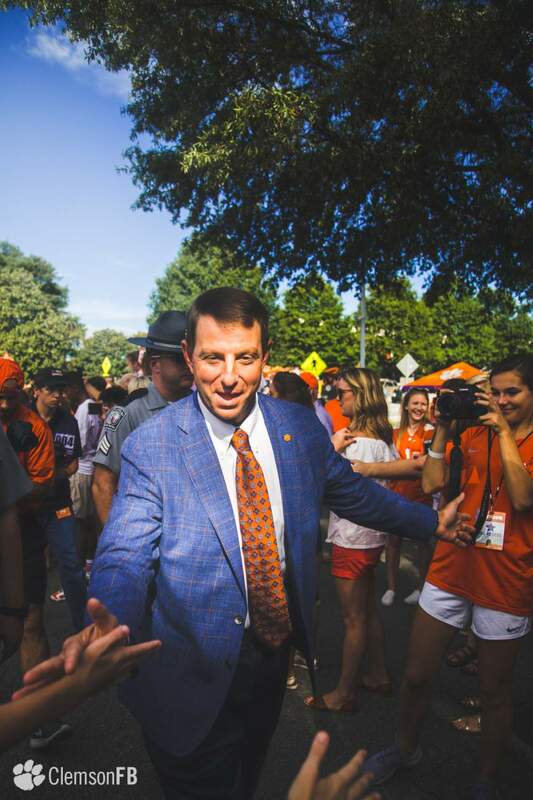 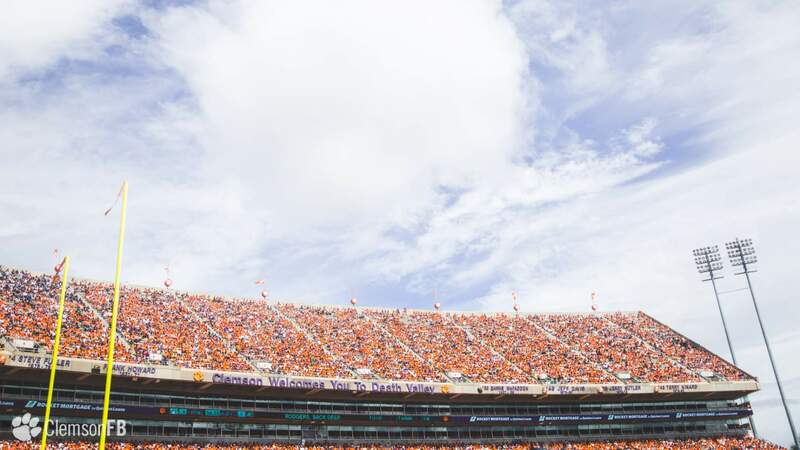 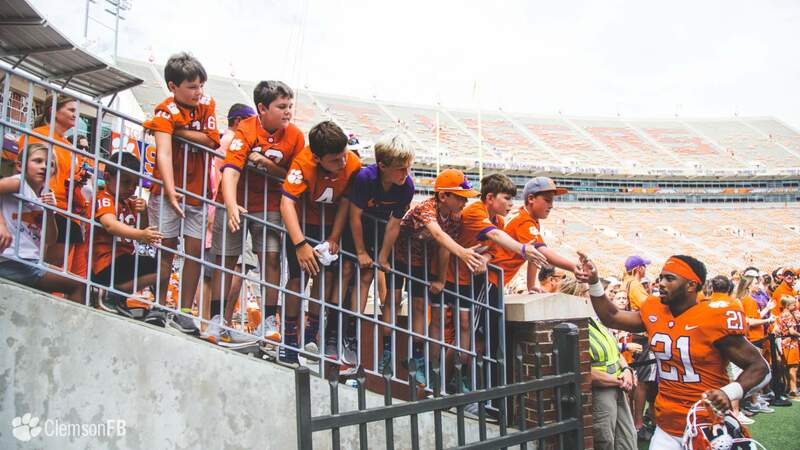 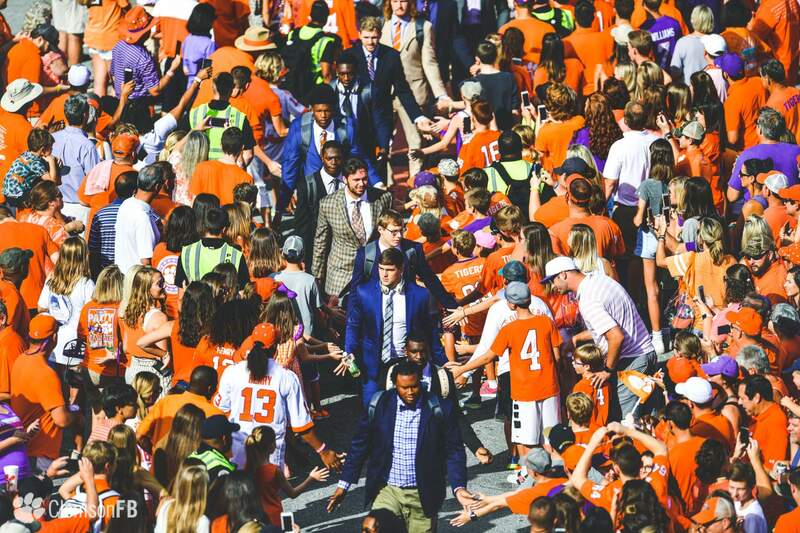 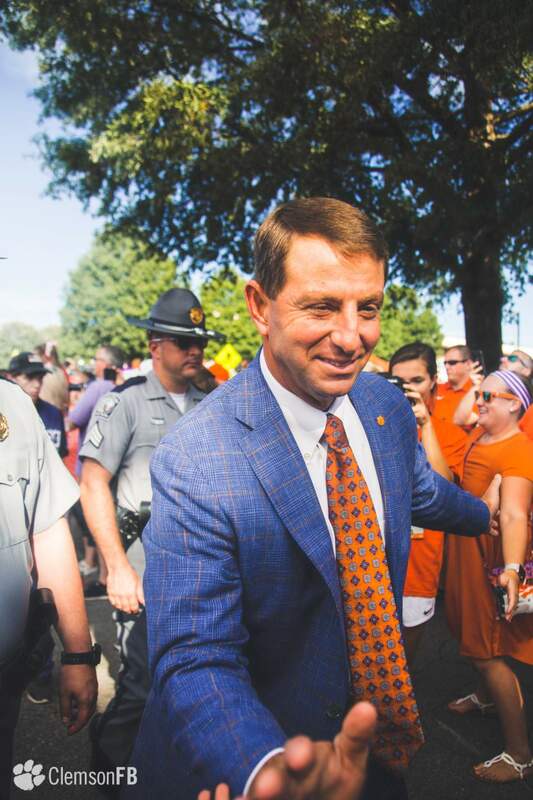 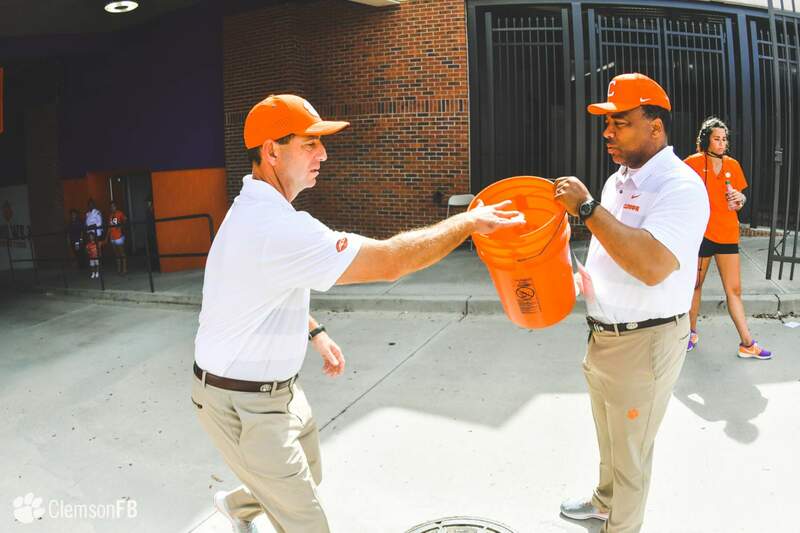 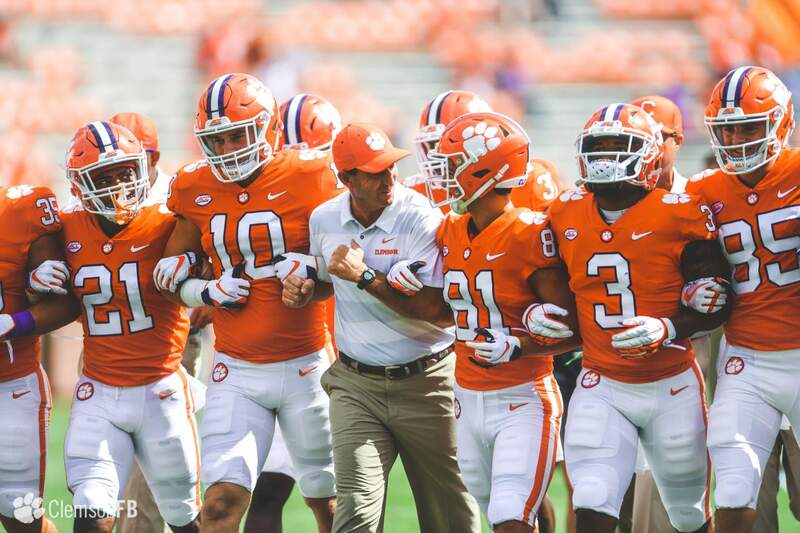 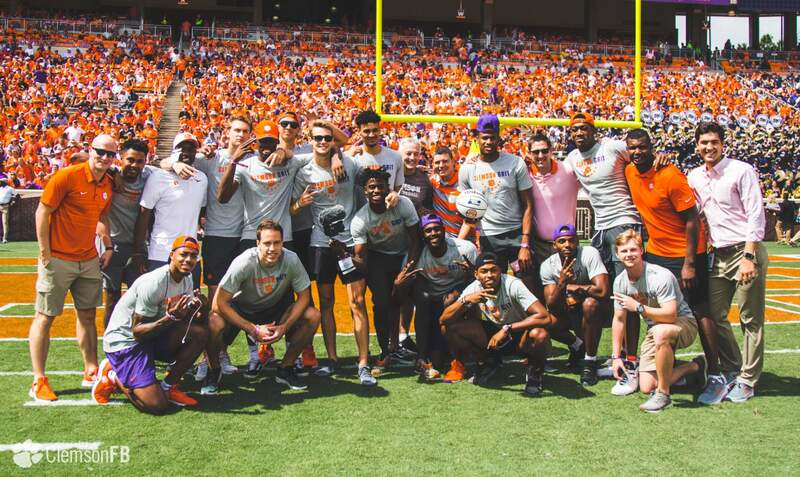 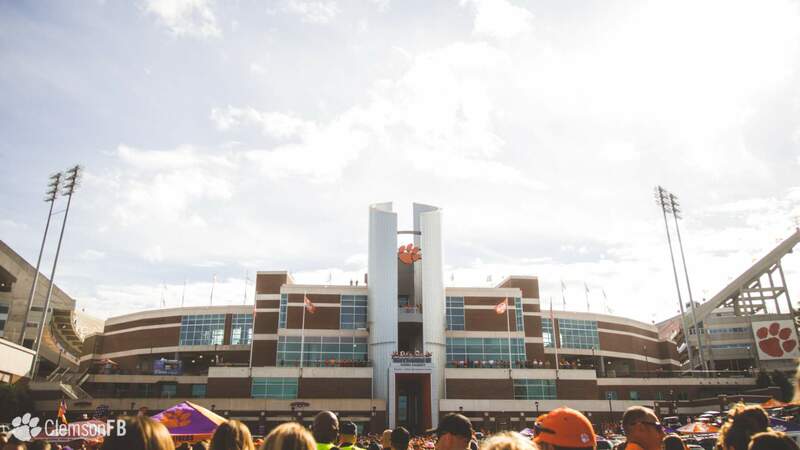 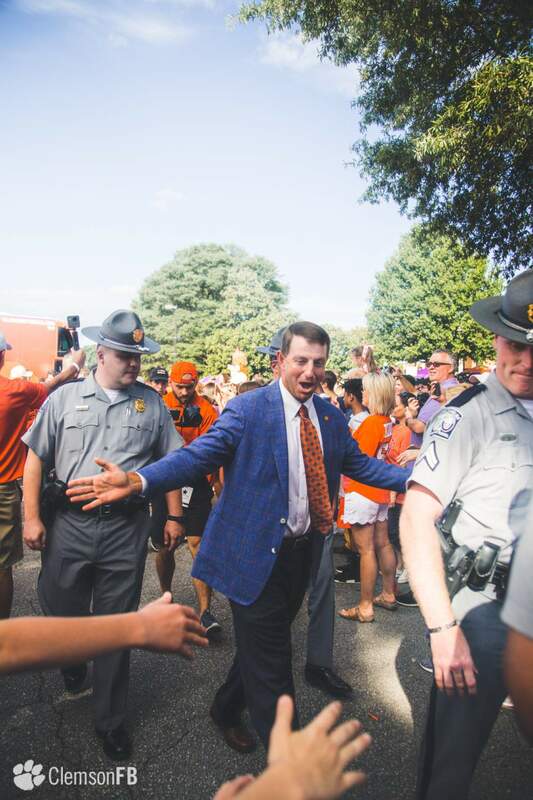 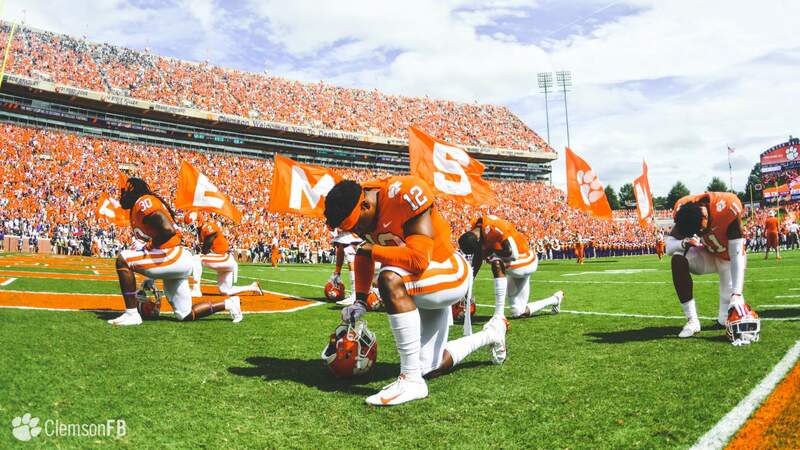 The team’s current home winning streak is Clemson’s third double-digit home winning streak in Dabo Swinney’s tenure as head coach (21 from 2013-16, 13 from 2011-12). 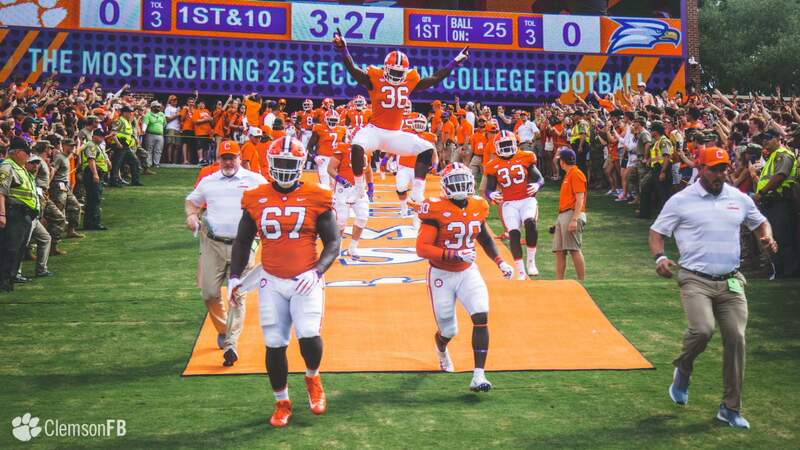 Clemson has won 31 of its last 32 at home. 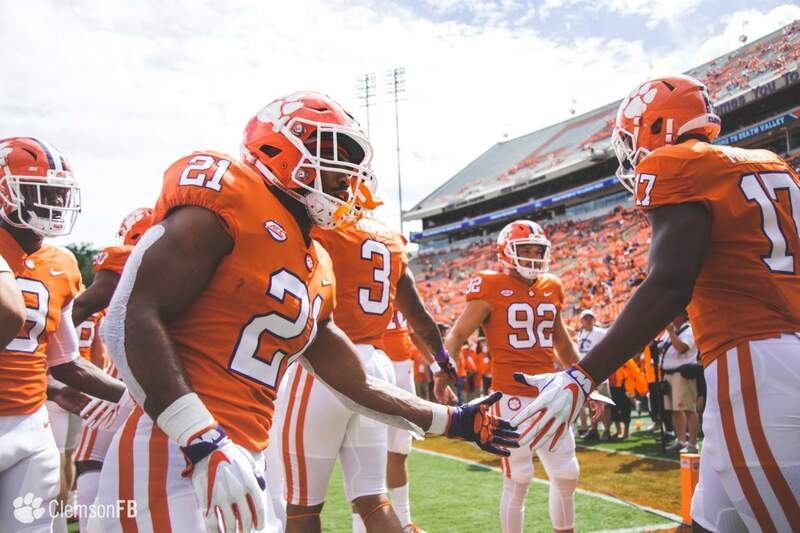 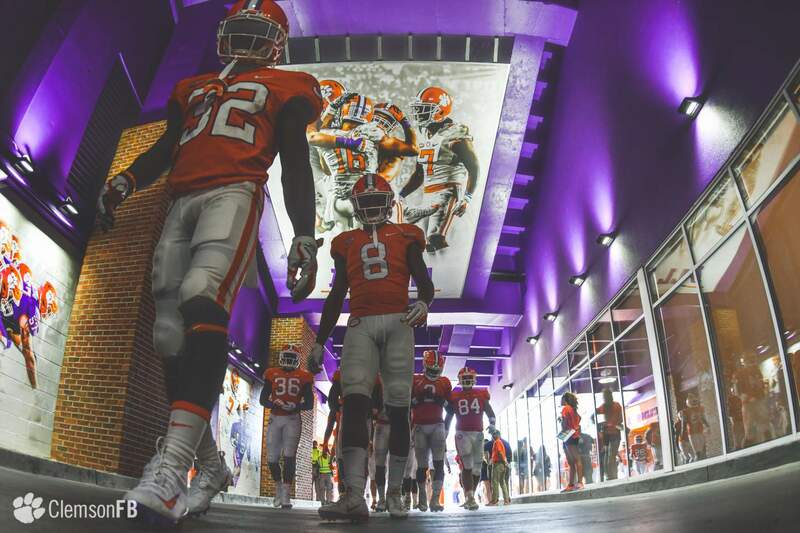 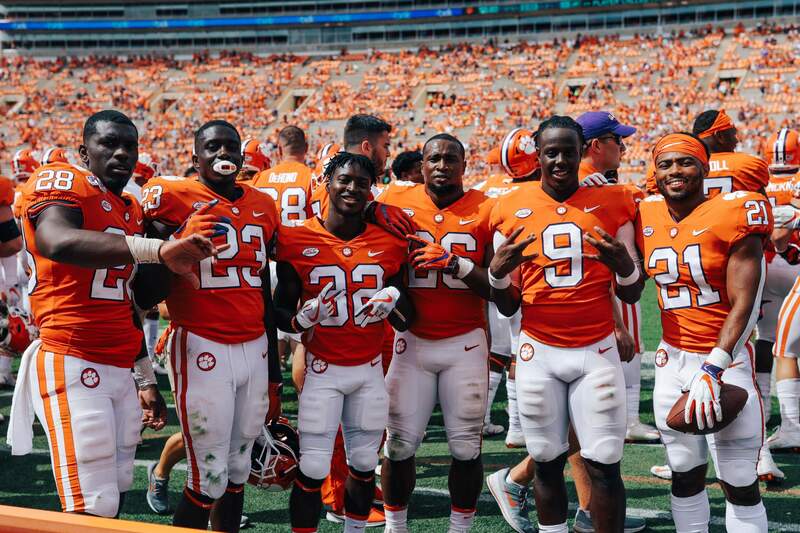 Clemson extended its winning streak in Saturday games to 19, the longest of any Power Five school in the country. 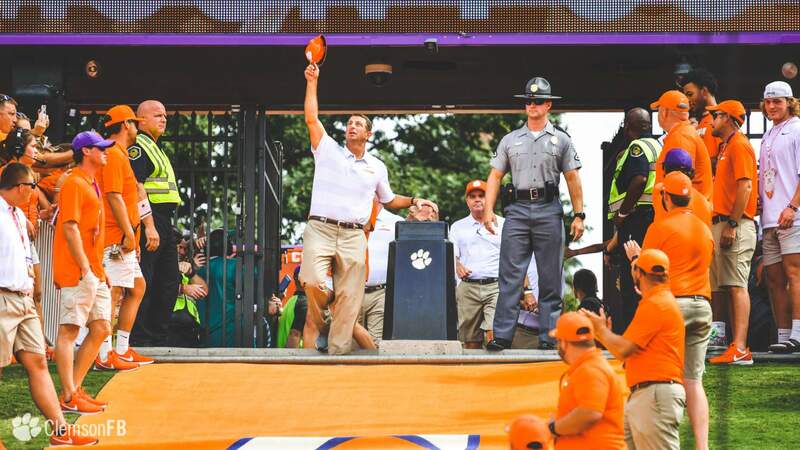 It is the second-longest Saturday winning streak in school history, trailing a 21-game Saturday streak across the 2014-16 campaigns. 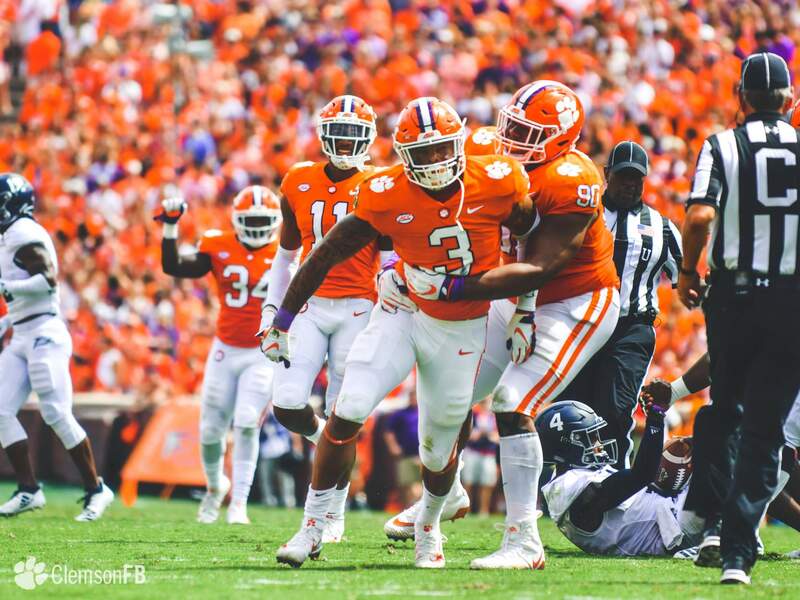 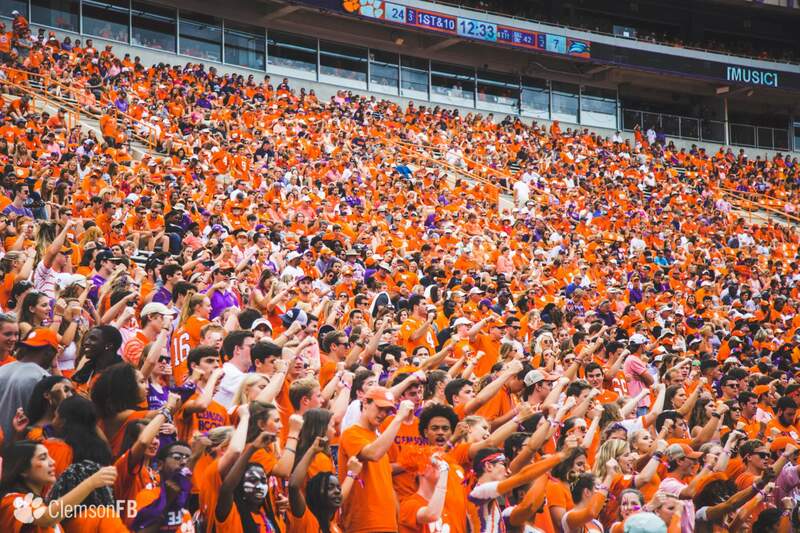 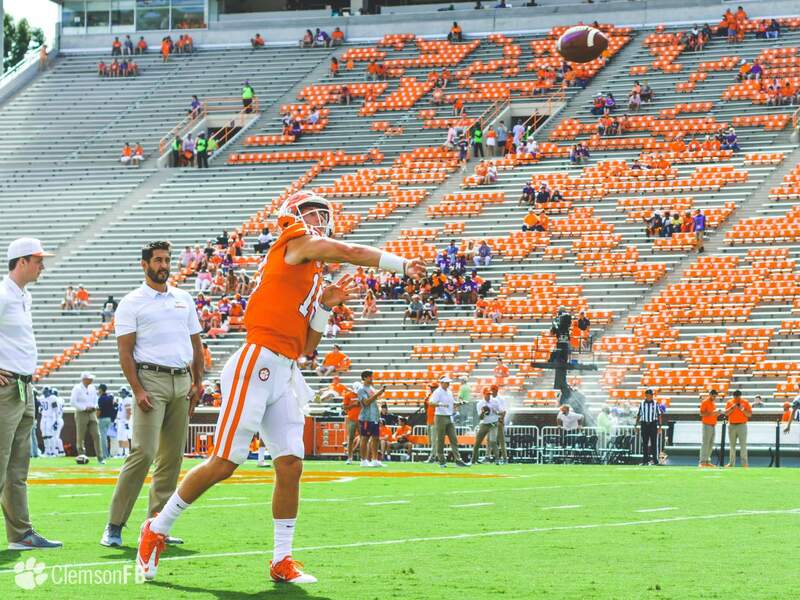 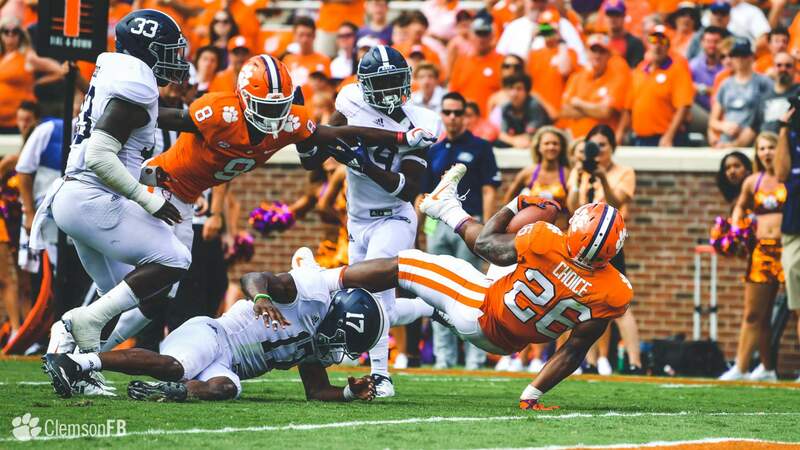 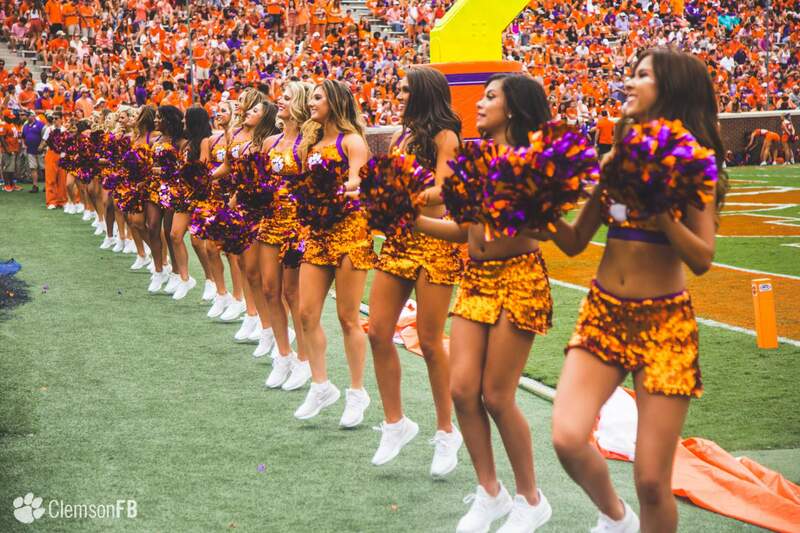 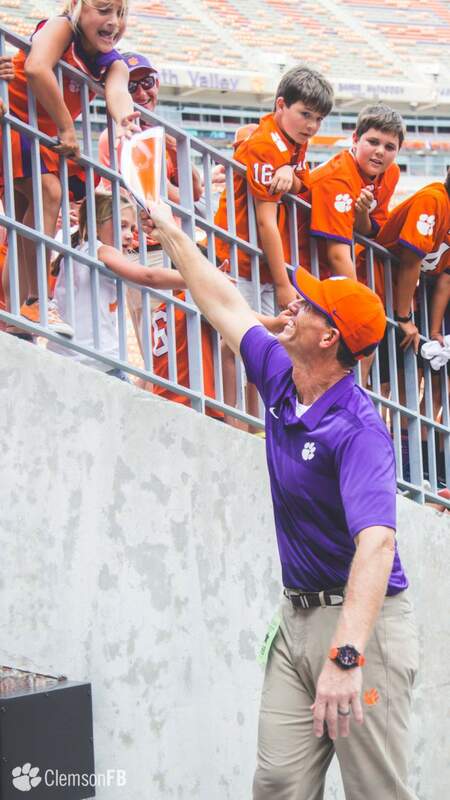 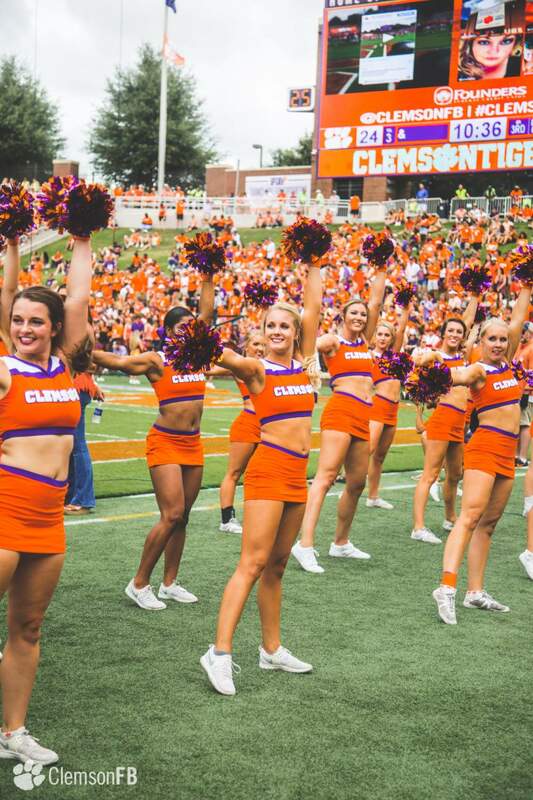 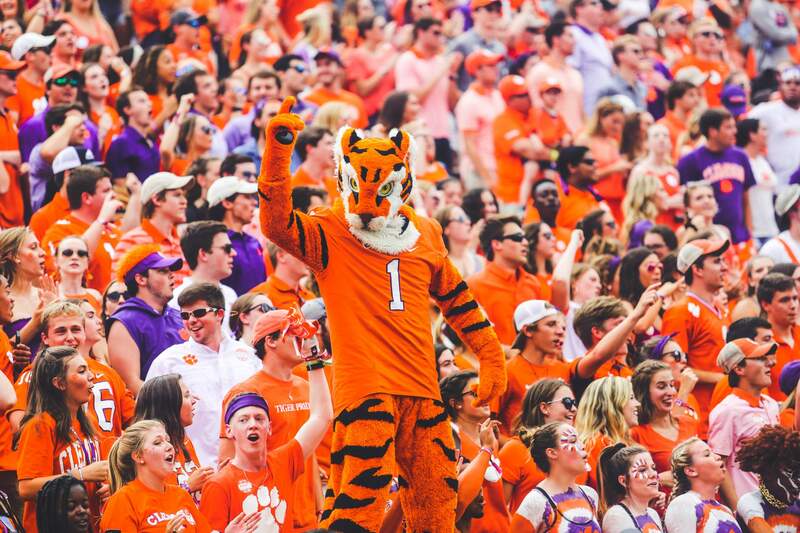 Clemson won its 16th consecutive game in the month of September, dating back to 2014. 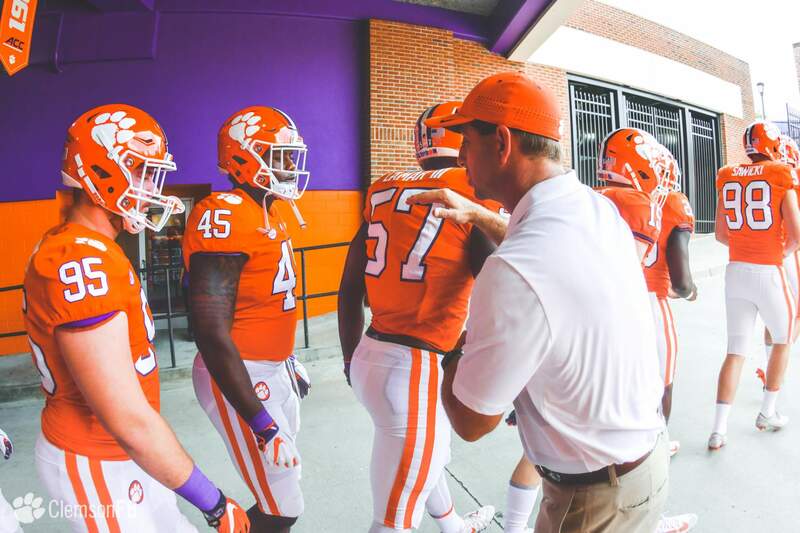 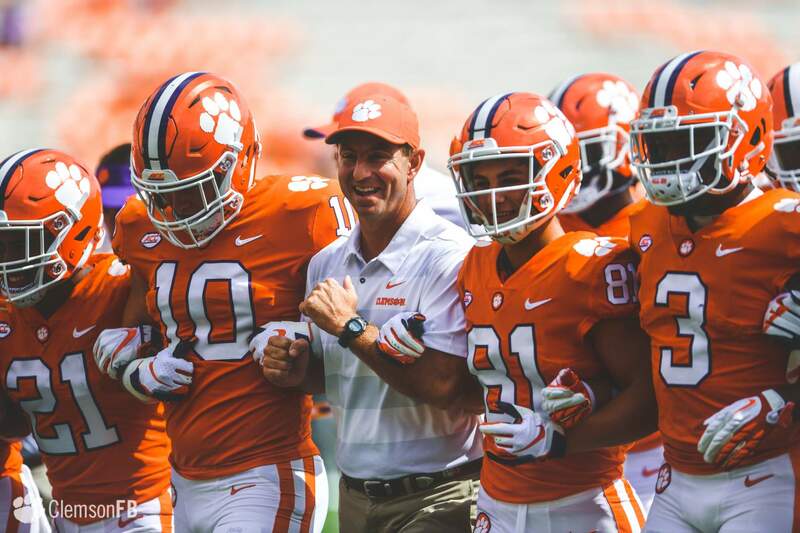 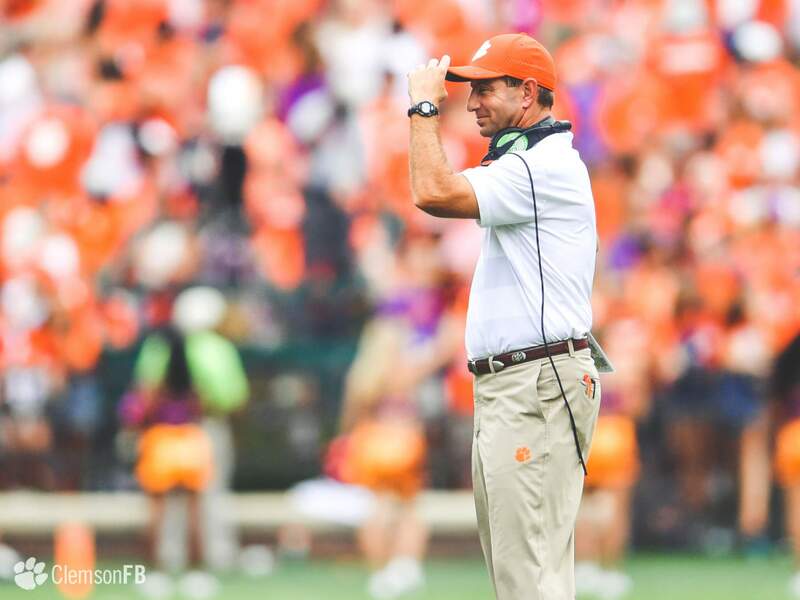 Dabo Swinney pushed his all-time record in non-conference play as a head coach to 39-13, including a 32-8 record against non-conference opponents in regular season play. 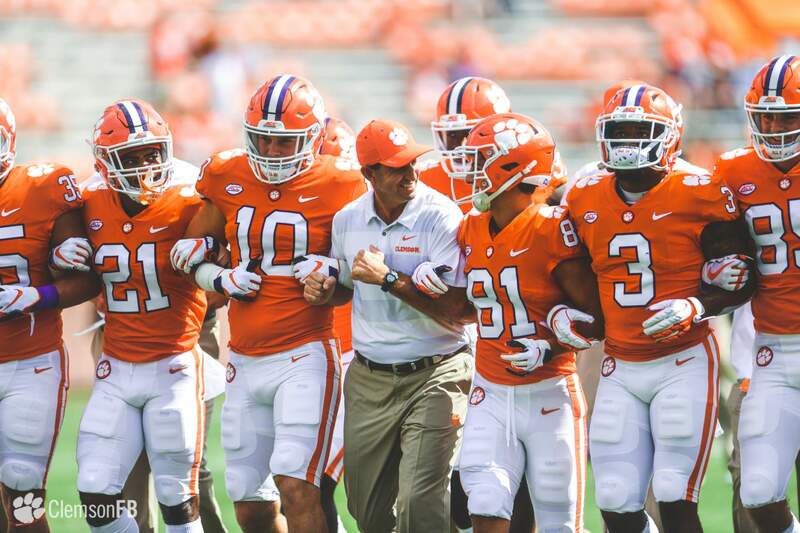 Swinney improved to 9-6 as a head coach all-time in games against schools from the state of Georgia. 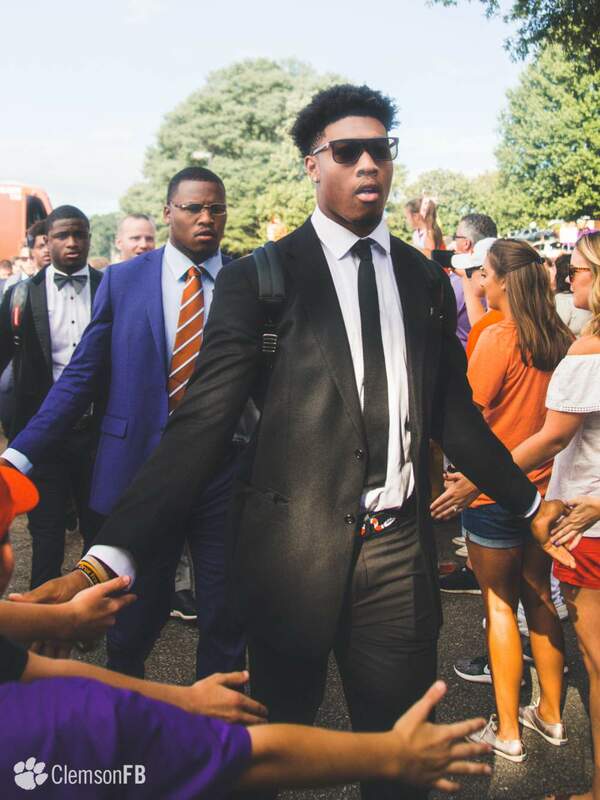 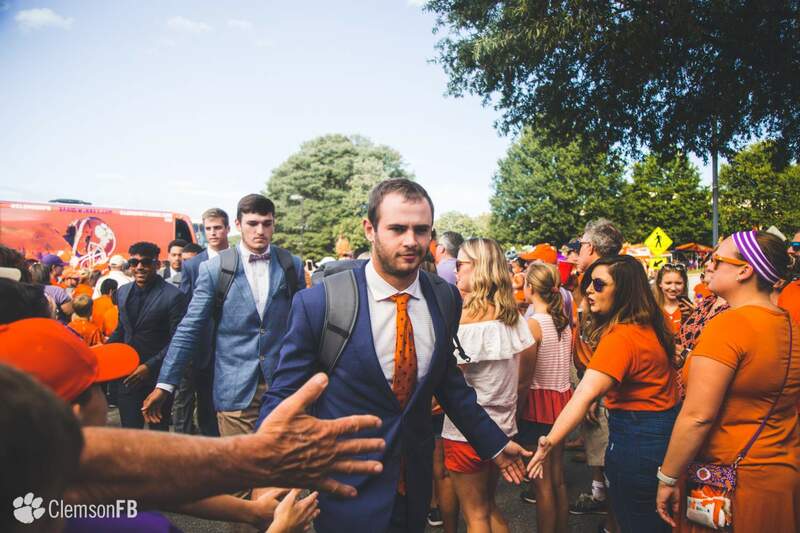 He entered the game with a 6-5 mark against Georgia Tech, a 1-1 record against Georgia and a 1-0 mark against Georgia State. 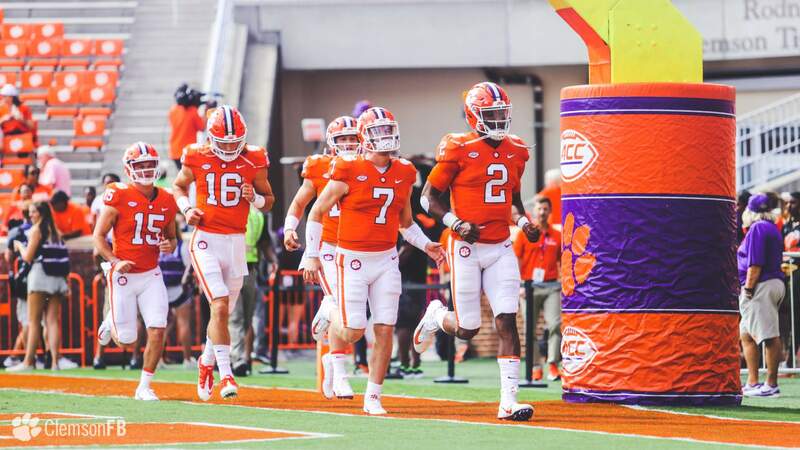 Clemson led 24-0 after three quarters and is now 76-2 since 2011 when leading after three quarters. 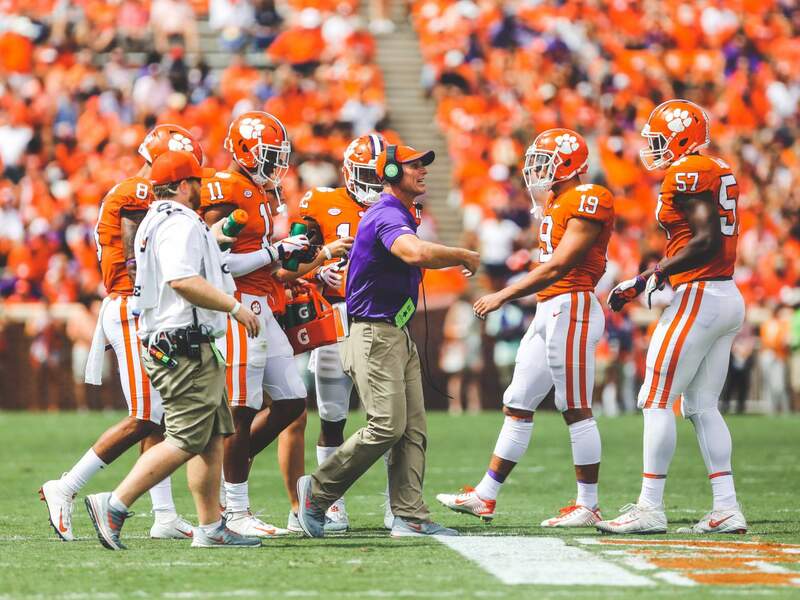 Clemson recorded a 27-3 advantage in total first downs, and is now 76-2 record when recording more first downs than its opponent since 2011. 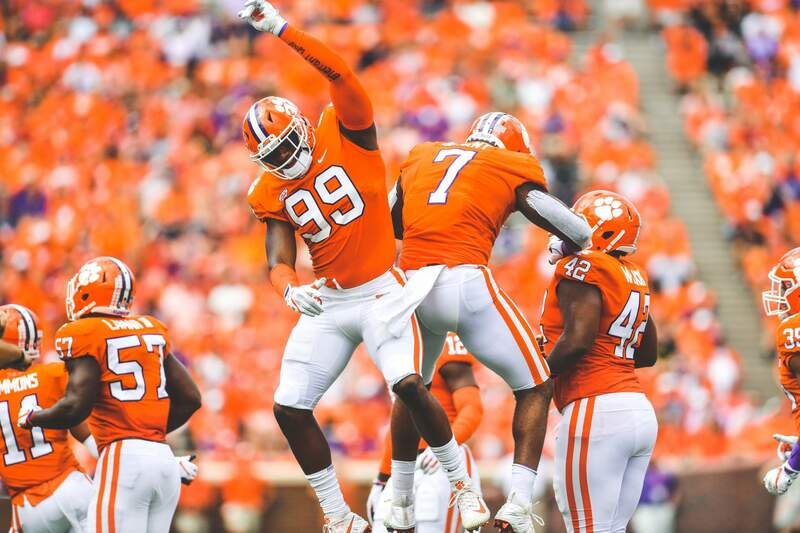 Clemson has now won 58 straight games when holding teams under 23 points (dating back to 2010).